Traveling in South America. – Brazil and Paraguay. 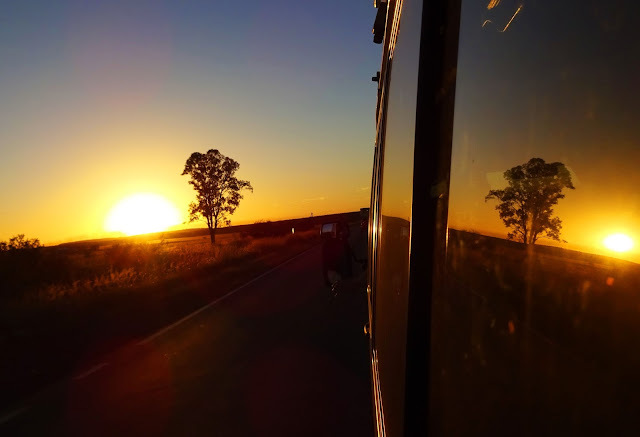 Sunset I caught out the window as we were driving to Paraguay. The three most powerful words ever spoken, “I WAS Dead”. Only the man named Jesus could say that He WAS dead and because of those three words, we have hope. Just imagine the moment a thirty three year old man lay dead in a stone cold tomb. Three days passed and then the wind of new life blew across His body. His heart started to beat again. Since He had shed every last drop of His blood, new blood had to now fill His veins. His Father filled His lungs with breath and He stood up, folded the burial cloth, and walked out of the tomb. Since He had never sinned, the rules of death were broken and death itself could not hold Him. He fought. He won. He lives. Now we can live. No matter how dead we may feel at times, how difficult our past or hopeless our present may seem, because Jesus rose, we also can rise from our ashes, and live. 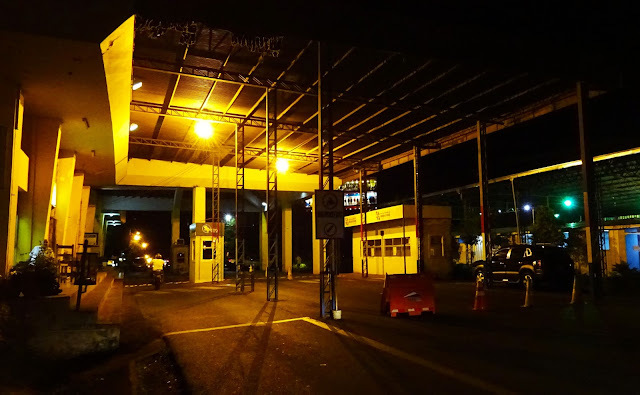 One of the Paraguayan borders late at night. We went in a dominoes pizza and they had “Apple” written on the menu. We were thinking it was a pie or something, but no, it was their “healthy” food option:). 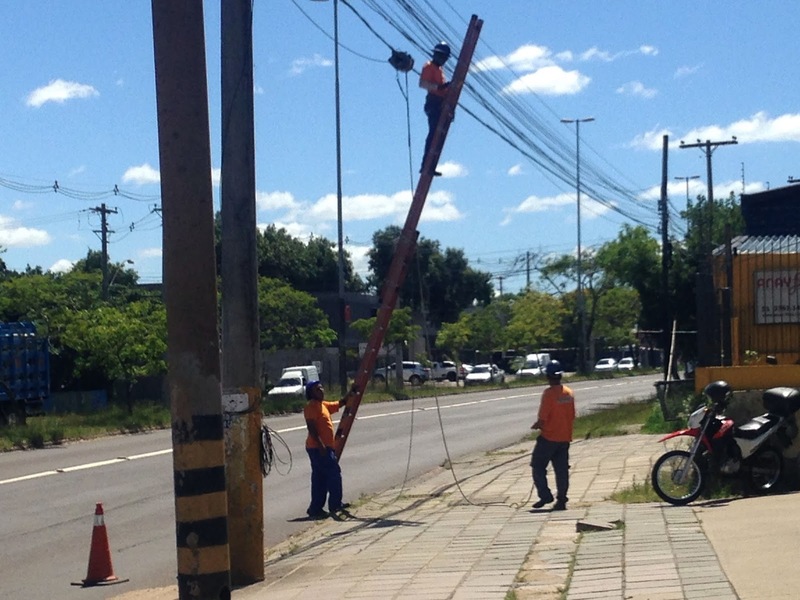 It is a really tragic situation here in Paraguay. The city is in extreme poverty and just a complete disaster. It was actually under a dictatorship until 1989 and then that party continued to rule all the way until 2008! This really effects the people and the way they are. 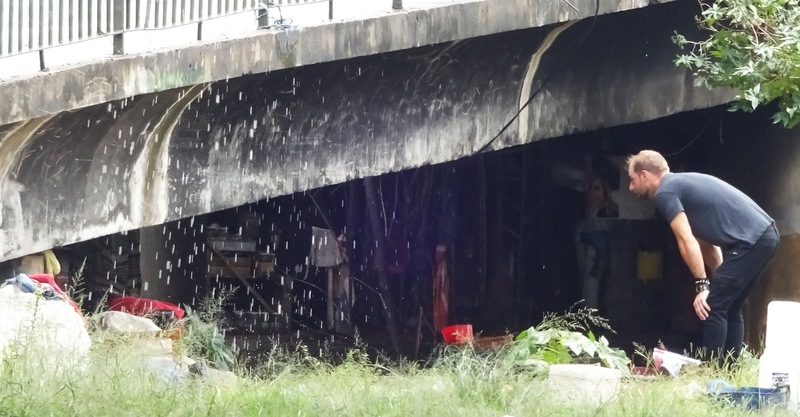 Because of bad flooding in January, thousands of people lost their homes and are now living in temporary shelters right in the down town center. They have very little food, drinking water and no electricity or bathrooms. The need is just overwhelming and we are praying for the Fathers grace and wisdom to effectively help these people and touch them with His love. I wish I was rich because there is just so much you could do to instantly, long term help a lot of people, but like Peter said, “silver and gold have I none, but what I do have, I give you”. What we celebrate on Easter is the only hope for all humanity no matter what we may be dealing with. A man named Jesus WAS dead and is now alive, therefore we have hope. 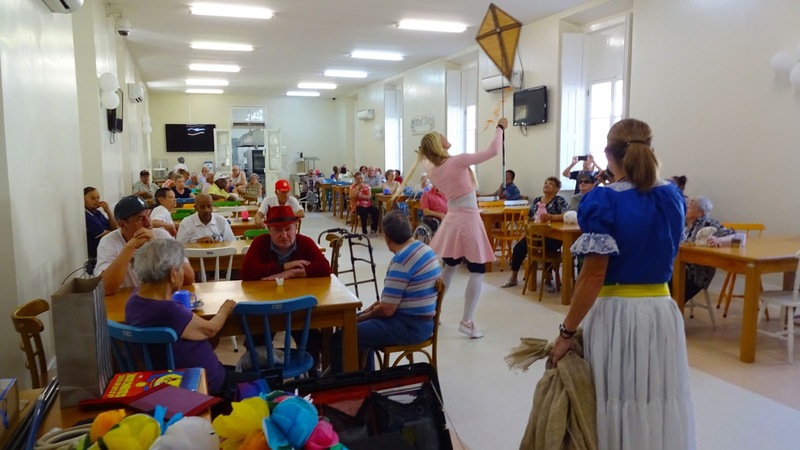 Performing inside a rehabilitation center. own rhythm and not being influenced by others. 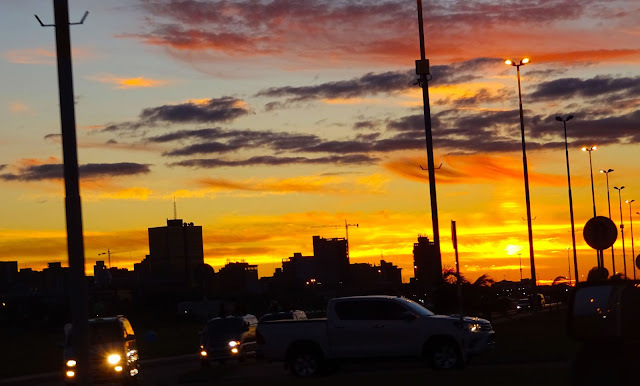 One afternoon I had a “chance” encounter and met the head organizer for city events here in Asuncion, Paraguay. We exchanged numbers and I later scheduled a meeting so I could explain to them the performance that my family and I do and we could discuss working together. When I showed up for the meeting, they told me the director was busy and couldn’t make it (even though I just confirmed it and had ridden my bike 6 miles in 95 degree temps to get here:)). Any way, as I began to get upset, they said, “don’t worry, he read the letter and was very impressed and told us to organize events with you” (I had previously sent a letter explaining the work that we do and that we offer it free of charge). So we were able to coordinate different events in different areas to reach the city. The municipality would set up a stage, bring seats, send out flyers and advertise on the radio and social media which drew large crowds. 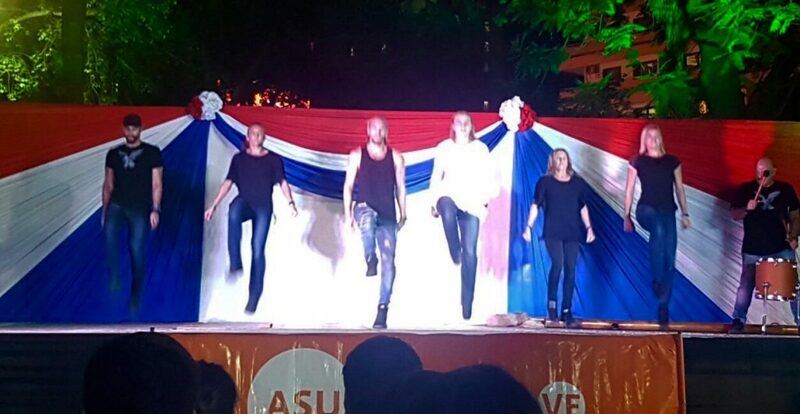 Preforming for Independence day in Paraguay. The government asked us to open their Independence day celebration concert. 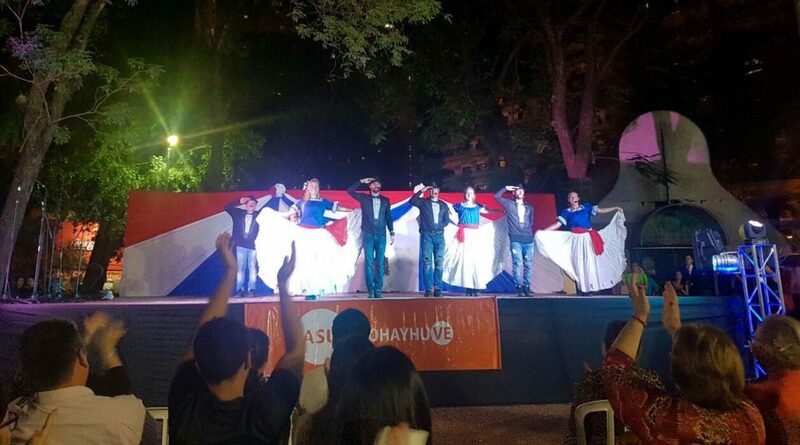 It was large event on a stage and it was an honor to participate in Paraguay’s most important day. The event was well organized and because of the quantity of performers, everyone had to be on a tight schedule. It was a very special day for my family and I, we each got to perform our personal act as well as our magic and group choreographies. Through each performance we communicate a message of the Fathers love, hope, forgiveness, change, second chance and family values. My sister performed ballet, I did Irish step dance, we did an act with fire and capoeira, a Tae Kwon Do choreography and clown acts and magic. 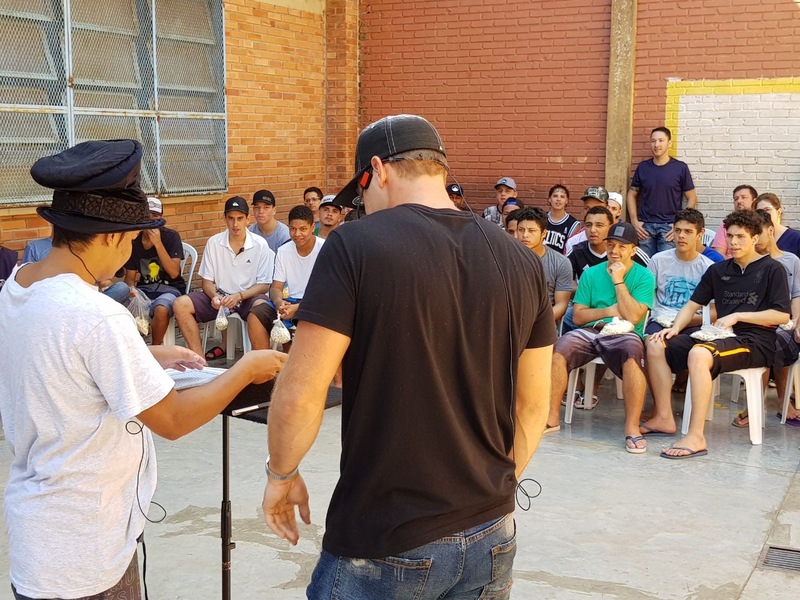 We were excited to learn afterward that it was broadcasted on live tv for all of Paraguay. Days after people told us they saw us on tv and heard the message of the Gospel through us. Talking with the crowd on the streets. The government also organized an event on a board walk that runs along a river. 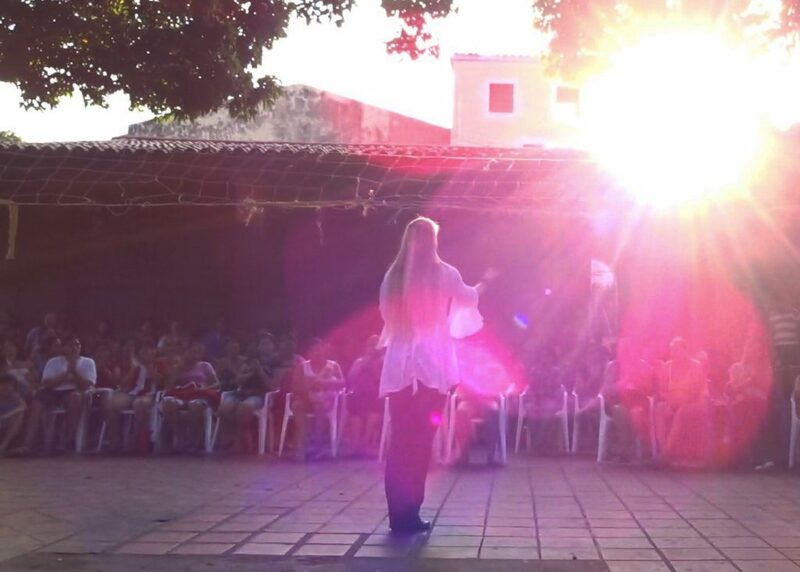 As we performed, behind us there was a stunning sunset, and in front of us a full harvest moon was rising. A lite breeze came off the river and it was just a beautiful night. The crowd grew so large that many could not fit in to see. We were supposed to be on a stage, which would have allowed a lot more people to watch, but the crew that set up the stage put it on the wrong side of the street where there were no lights :(. Many had received the invitations and come from all over the city and from different functions of the government to watch. It was such a privilege and we shared so much over the three hours we were there. 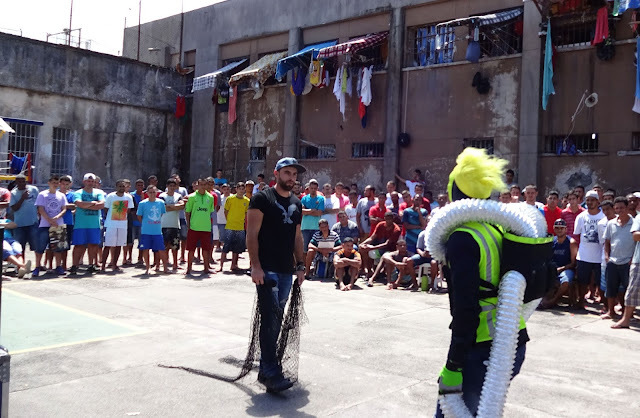 We organized another event with the municipality in the center of the poorest area of the city. This event was for the victims of the flood who are living in temporary shelters right in the city center. These people have nothing and are really suffering, especially the children. They were thrilled to get a free show and see all the magic. One little boy ran up to me with a beaming smile on his face and wanted to play with the bubbles I was making. His left hand had been completely burned off and his whole face was distorted from severe burns. He told me that his house had been burned down and he was trapped inside. His little brother said he always helped take care of him and they both just wanted to laugh and be held. Ill never forget his beautiful face. I put on our giant frog costume and my sister and I walked through the shanty town inviting everyone to come to the show. Crowds followed us out and I felt like the Pied Piper:) (Except dripping in sweat and walking through mud trying not to fall since I could not seeing anything in the costume with kids hanging on me so yeah, super romantic 😉 :)) . We had made over 500 sandwiches which we gave out afterward along with some of our extra clothes, candy and toys for the children. If you have ever been in extreme poverty, you know how impossible it is to give things out and keep order. Desperation takes over and you have to be really organized and have plenty to give. It was difficult and exhausting to manage this situation but God gave us the grace and wisdom. When we left we felt like we were leaving a war zone because of the extreme focus and mindset we had. So many people say that to help people in these desperate situation can’t be done, but when you take time to plan things, it can be done and should be done. Sometimes its just our own laziness that makes excuses and if we make even a small effort to love others, God can bless it in a big way. 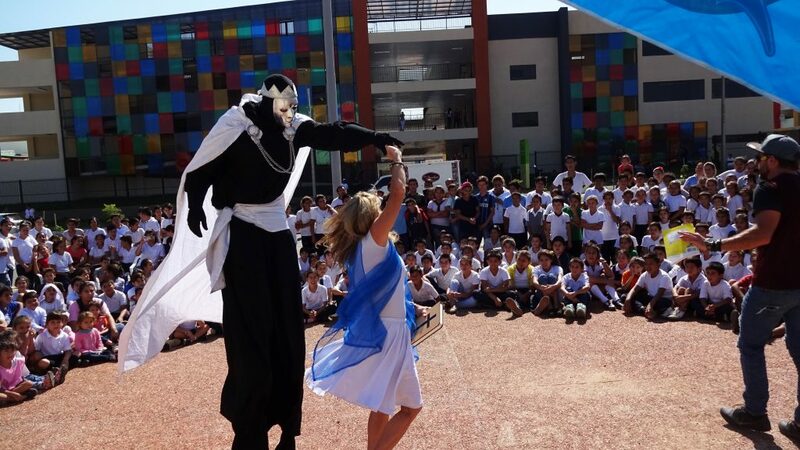 Playing with the children after our performance. Within one meeting, I was actually able to meet with the Minister of Education (highest up person who usually takes a while to get to), and she opened to us the doors to all the schools and colleges in Paraguay. Three ladies spent their time driving from school to school organizing events for us at the schools that needed it the most. They did a lot of the leg work my brothers and sisters and I usually have to do ourselves, such as going all over the city, meeting with the school directors and organizing the logistics of, space, place, which grades and times. I really appreciated their help! Performing a play at a school. 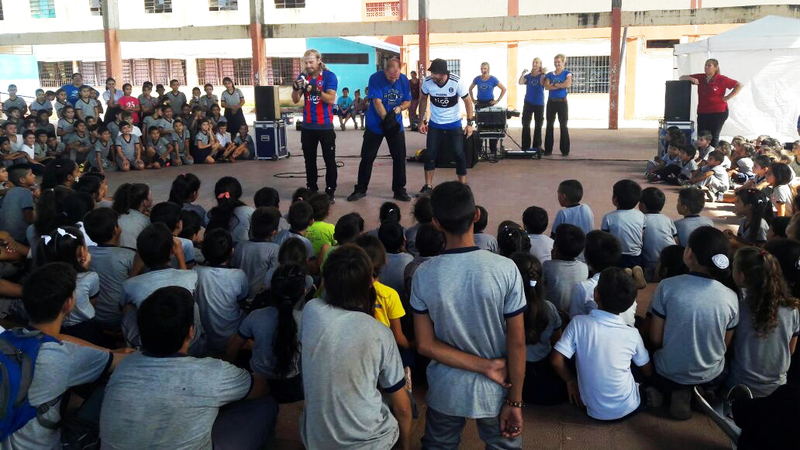 At this one school we visited, there were 800 kids and we had to do a few groups. If any of you have worked with kids, please imagine and visualize working with 800 kids at the same times from preschool all the way through high school age:) This was a new school just built for all the families and children that lost their homes in the flood. It was the first and really only thing the government had done to help. When I first walked in, there was a little girl standing there just weeping. She was so scared and lost. 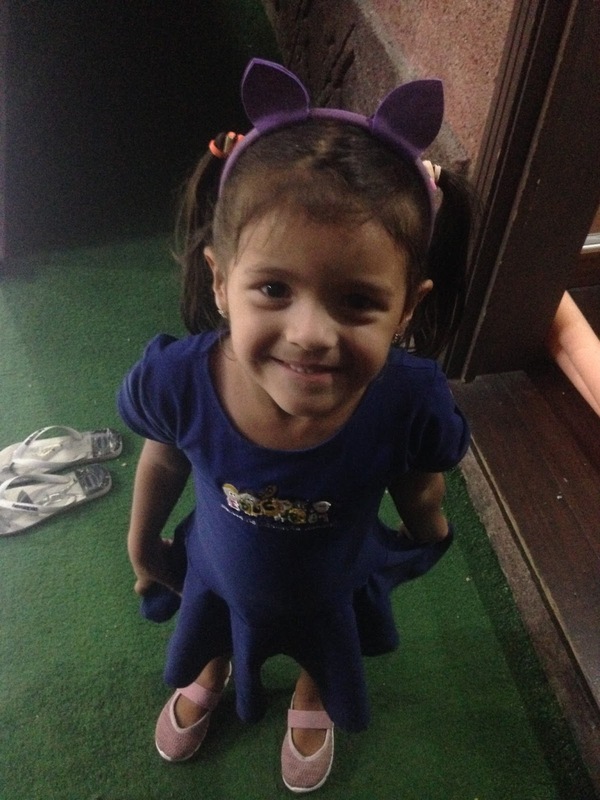 I held her in my arms and helped her find her way but this was the state of many of these children. They were so sad and scared. Many of these kids had no parents and have been moved from place to place with no where safe and secure to call home. They were desperate for love and attention and it was such an honor to bring them laughter and give them seeds of hope. 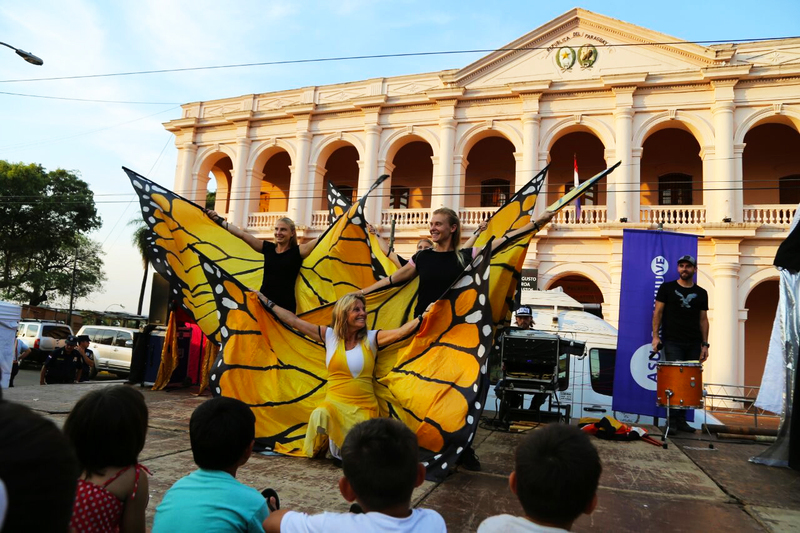 In our performance we tell a story about a little girl who is chasing butterflies but cannot catch them. Like we all chase dreams and look for change. Through the story she meets a giant frog (me in a costume;)), a cool dwarf, (my sister in a costume), and a prince (my brother on stilts). She learns that she cannot catch butterflies, because sometimes life is hard, and we cannot get what we seek, but she can become a butterfly! Sometimes things on the outside will not change, but if we change, we can find hope. A psychiatrist who works at the school told us that in 2 hours we had done more for the kids then she had been able to do in months to help them and give them practical answers. When we drove away, a little boy was running full speed after our van wanting us not to leave. It broke my heart and I will never forget that image. This is where the children live at a certain school we visited. 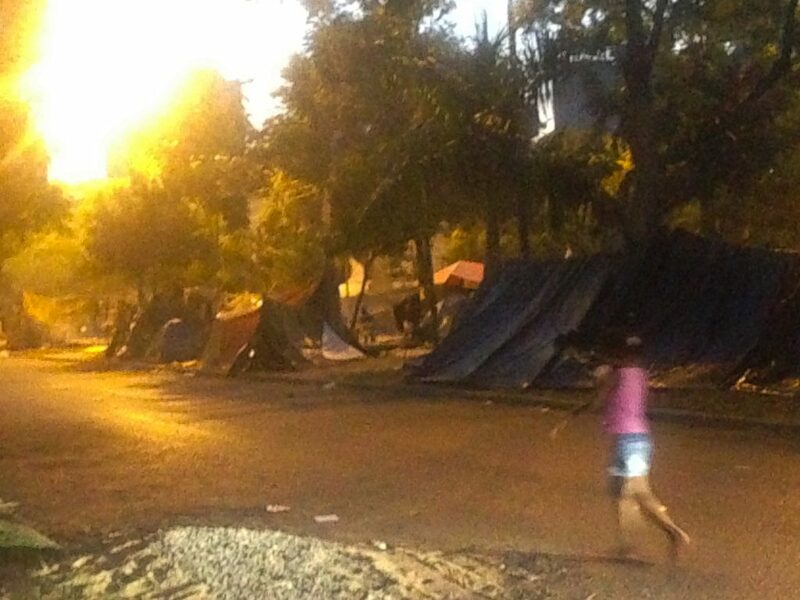 Because of the floods here, many people are living in shelters all throughout the city center. It is really sad to see all the shacks made out of cardboard and garbage bags all around and when it rains, these “ homes” become just a sea of mud. A lot of these people don’t go to the center, so to reach them we spent time in the evenings just walking up and down the rows, through the villages and going house to house talking to the families. We met some really beautiful people with amazing stories. One lady we met while walking through a village, started a home for the elderly which she tries to run in her own home. Her husband helped her start in but then tragically, he died, and now she struggles to be able to afford to take care of all the elderly folks that come to her. We gave her 35$ which allowed her to be able to get a lot of rice and beans. She broke down crying, just so extremely grateful. She said God sent her angels today to pick her up. 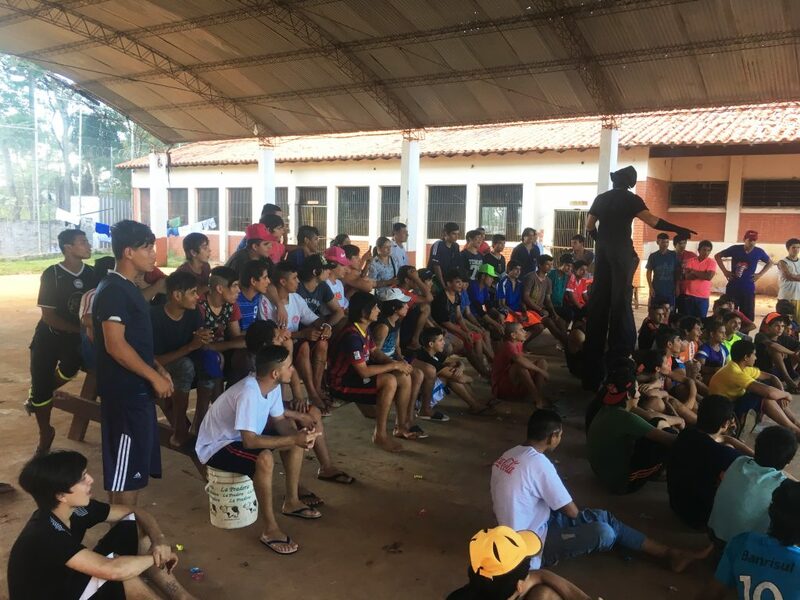 Originally when I approached the director of the largest prison here in Paraguay, and asked for authorization to enter, he said we could only go in a small room on the side of the prison which would hold around 30 men. But after showing him pictures of others prisons we have visited around the world, and explaining that this was a big event, he allowed us to go in. 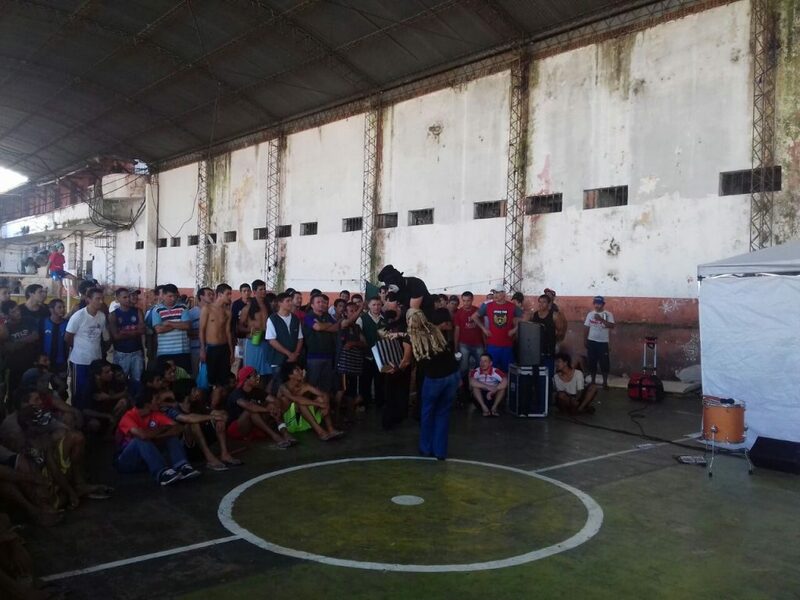 This is the largest, most overcrowded prison in Paraguay and is a very, very bad place. 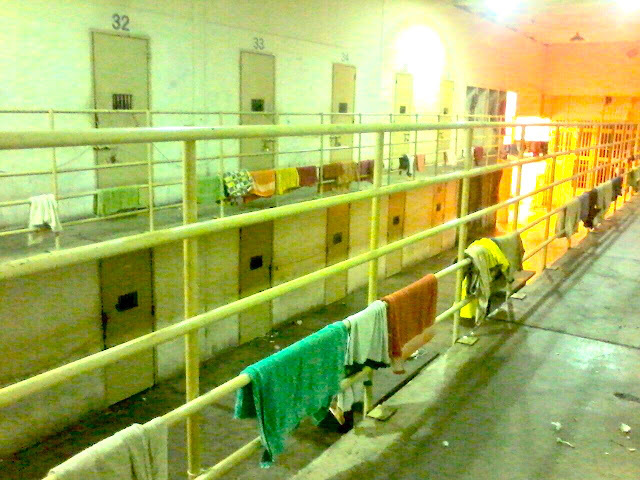 Unlike most prisons we have been to, there were no “patios” or separate sections here. As in, all 5,000 prisoners were all walking around the prison at the same time and in the same area. Basically like a huge city inside a prison and just complete chaos. People shouting, the guards blowing whistles, little fights breaking out between the prisoners, soccer balls flying, guys crowding around and begging us for things, ecs… The conditions were just horrible with the walls covered in mold and crumbling, the smell was terrible and the men were starving because they barely had enough food. We set up in the center and everyone crowded around. It took a lot of work to pull this one off and we had to be at the top of our game every second but the Lord Jesus was with us and we were able to share many things with them. 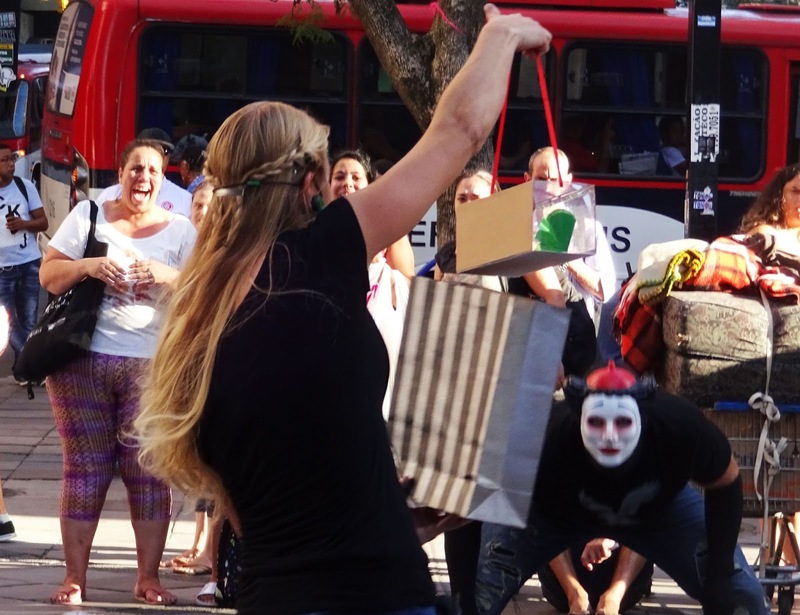 We do a magic routine that has a message in it about time, eternal life and gives them a perspective beyond these walls. It really connected with the guys. I do an act where I start out playing a flute (a plastic recorder that breaks in half). Someone comes up to me, steals and breaks my flute. I use the flute to symbolize our life or our heart. So many things such as tragedy and mistakes can break our “flute”. In the skit my brother comes out acting as Christ. I take my broken flute and give it to him. He holds each half in one of his hands and stretches them out as if on the cross. He then “rises again” and puts my flute back together. Then he gives it to me and also calls over the one who broke my flute (my brother acting the part). He explains that we are all broken, the criminal and the victim and that Jesus was broken for us, like I shared earlier in this blog. 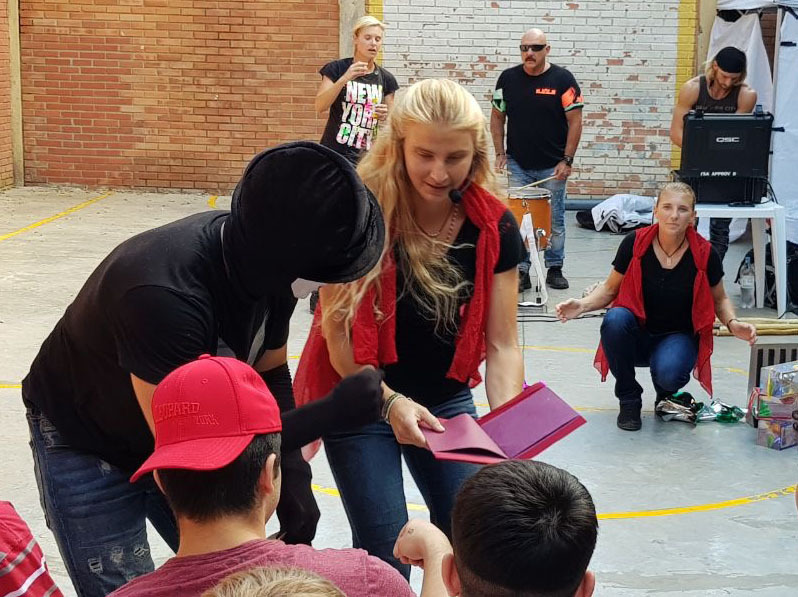 It is always hard to describe some of our acts and theatrical performances to you, but if you picture them with moving music and costumes, performed in a theatrical way, it helps. As I walked out of this prison a man said to me, “Thank you for bring light into such a dark place”. And that is the only thing we are tying to do. That is why we try to use so many different means, acts, music and measures, so in some way we can bring light into their dark world. Another prison we visited was about a two hour drive out into the country. 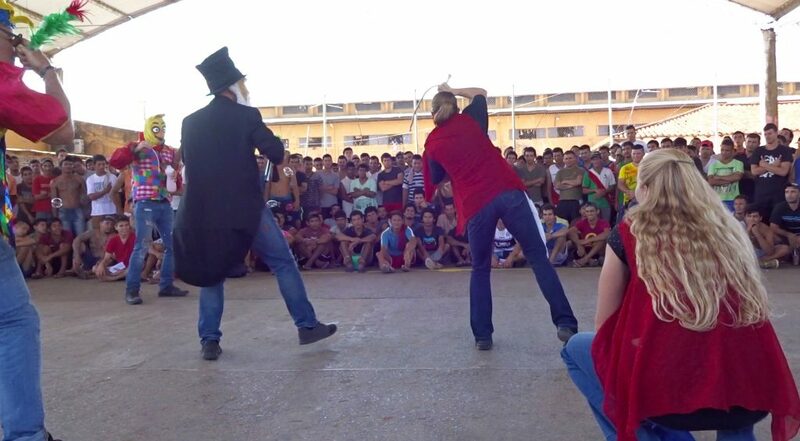 The director was so cool and allowed us to perform right in the main area so we were able to get the whole prison. As we started, there was some fire nearby that began to blow think smoke and ash into us. I thought we were going to have to leave but then as quickly as it started it stopped, and I thank God we could continue. Literally the entire crowd of 700 to 800 guys were so engaged and listening to everything we shared. I do a skit where I use words written on large cards like, “Why”, “Remorse”, “Regret”, “The Past”, I drop the words on the ground in the pattern of a circle and I explain how thoughts about the past can keep us in a cycle of regret. So many times the cycle begins with the word “why?”, “why did I do that?” “why did he say that?”. We wander around and around in our mind as if lost in a dark forest going in circles of the same thoughts about the past. We end up right where we started, getting no where and change nothing only to start again. Then I take new words out of a New Testament like, “You have a future”, “you are forgiven” and drop them on the ground in a line leading away from the circle. I explain how we need new thoughts to change our mind. If we would study the Scriptures, we would find answers and new thoughts that will lead us into a future. We spent a long time there and it took a while to leave because everyone wanted to shake our hands, tell us their names and stories and receive personal attention. It was a beautiful moment I will never forget. One guy gave me a beautiful rose made out of medal that he had made to thank me, it meant a lot to me. When we were finally out and had gotten all our equipment back through security, the director, who had watched our whole show, said, “wow, my mouth is on the ground. I never imagined anything like that.” He was so grateful and had never seen the men so engaged. The director of the orphanage was a very kind women and was so grateful and glad that we had sought them out and would come there. It was a smaller group, maybe 100 kids, but they were so precious. It just breaks your heart to see the pain and sadness in their eyes and know they have seen things and gone through things well beyond their years. At one point in our show, in the middle of a clown act where my brother is crying because he has no one to celebrate his birthday, all the kids came up to him to hug him. It is a funny act about smashing a piñata, and usually everyone is laughing, but it was both touching and sad to see all these kids identify with him acting sad and lonely and having no one to celebrate a birthday with. Each child was so desperate for love and attention and desperately wanted to participate in everything. I just wanted to keep holding these two little girls who were adopted sisters and not let them go. Many of these children have lost their parents, and many of the children were given away when their parents decided they could not afford them or did not want them. I can’t imagine a more tragic reality then realizing your own parents gave you away and didn’t want you. The director explained to us how hard it is when she receives confirmation that their parents are not coming back and she has to try to tell explain this to the children. She told us that she tries to put it off as long as possible before she explains to them that this orphanage is now their home. She said many of the kids, especially the older ones, just loose it and will try to run away, break things and just cry. It takes a while for them to adjust to this home. It was such a privilege to give them some seeds of hope and tell them that they have a Father who wants them, and loves them. 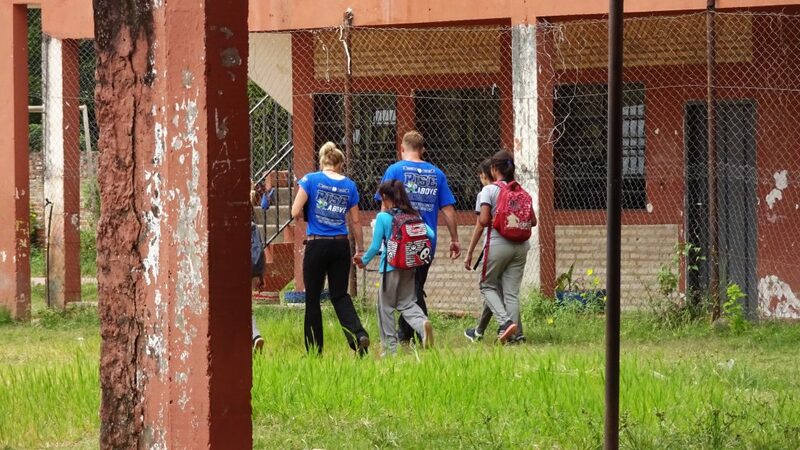 The next week we returned here to a large school next to this orphanage that is run by the same foundation. There are 900 kids here and most of them are either foster kids, orphans or have been through something traumatic. We performed for about 500 of them, which, is A LOT of kids:) They had fun bouncing a massive ball above them as we set up and then we got them all to sit down and they were very respectful and well behaved. We taught them many things to help them and comfort them in all their suffering. My youngest brother wrote a rap/song that has a message in it about being the bigger person, taking responsibility and helping make peace with others. We act out two people arguing, then my brother comes in and through the song says he is sorry, cares about them and helps them make peace. The words “I am sorry” can be so powerful and prevent heart break, sadness and even divorce. “I am sorry”, “its my fault”, “I love you” are words we all need to be quick to say. These words can bind a family together, save a marriage or friendship and dissolve friction and tension between two parties. So many of these children come from broken homes and at times hear their parents shouting at each other. Sometimes a little love and humility can make all the difference no matter who’s fault it is. We wrote a children’s story about a giant frog who feels all alone and wants to give up. Throughout the story we communicate the hope of the Gospel in a simple way and teach to not give up, but that God the Father wants us and loves us. We gave each child one at the end along with a bracelet we made. As we travel we make bracelets so they can have a memory of the day and all we shared. ( It takes a long time to make 500 bracelets :)). So many of the older kids wanted to participate and at the end a lot of the kids joint with us in a participation dance. My brother on stage at a school using a costume he built to communicate how our free will is like a super hero. We had a very special evening at the women’s prison here. The prison was built to house 200 women and now holds over 500, so they are in a very difficult situation. I was able to get chairs so they could all sit close and they were so grateful and engaged in everything we did. 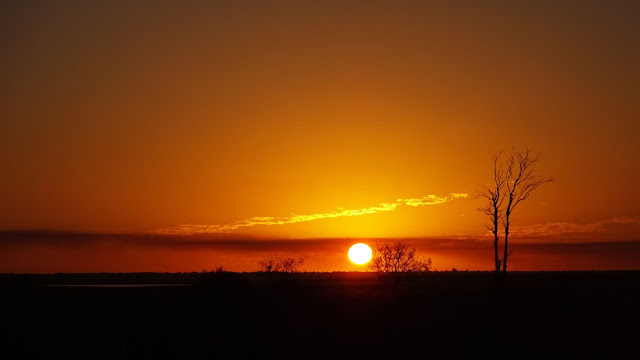 I sing a song about a wounded bird that flies again and I share how we are all in a sense, “a bird with a wounded wing” (like I shared at the start of this blog) and in our broken state, the Father is by our side and lifts us up so we can fly again. 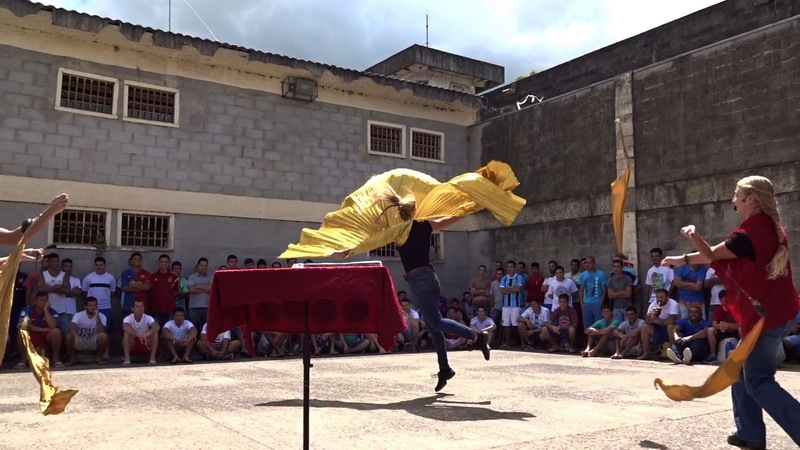 Performing Irish step dance in a women’s prison. At the end of our performance my whole family and I do a dance where we use all the dance moves we have learned from the cultural dances of the countries we have visited. Afterward, we invite others to join in the dance. It was so beautiful to watch as gradually all the women came up to dance. Many were in tears when we left. One lady told me it was the first time she had been given a bible and would treasure and read it always. Most of the women are serving time for drug related crimes, most often carrying drugs to make money to support their children. Some have been set up by their partners, like one young girl whose boyfriend asked her to hold his back pack, then took off. She had the back pack with her when the cops caught her and found drugs inside. She had no idea. The other day I read a story from the US about a women who drew a map for someone that ended up being a drug route. She thought she was drawing the map for hunters. She got a 16 year sentence! Its just tragic. I read a good quote by Winston Churchill that said, “Success is not final; failure is not fatal. It is the courage to continue that counts.” Our mistakes do not have to destroy us, nor are we defined by what we have done, whether good or bad, but what matters is that we go forward and never give up. The down center is taken over with temporary shacks and shelters. A certain school we visited was in a horrible part of town, it was surrounded by temporary shacks that all the victims of the flood are living in. At this school the children were older, from 12 to 18. They all brought their chairs out of the class rooms and arranged them in a circle around us. We do a cool thing where we ask them who wants to be a leader and won’t be controlled by peer pressure. After we get a few volunteers (in this case like 20! ), we give them cards to read that have meaningful historic quotes written on them such as, “We have nothing to fear but fear itself”, and many inspiring quotes from past famous figures. We then have a competition to see who can read it like a leader with emotion, diction and passion in their voice. It was really cool to see these kids get into it and try to speak with all their heart. This time we had a three way tie for winner. It is a good exercise we use to help them come out of them self and learn to speak and lead regardless of what others think or do. We have a number of games and activities like this. My brothers in the middle of a really funny clown act about a dog chasing a clown who stop his ball. This one little girl named Sandra, maybe 13 said she couldn’t read but wanted to participate. She was so sweet and I helped her just say a phrase about how hope can be given as a gift. It made me sad to realize how broken the education system is if a 13 year old girl has not yet been taught to read. Another girl named Alisa who was 17 years old girl told us her mother had recently died of cancer. She was in tears, and really touched by our message. She told us that we had given her hope today and given her words to help her begin to heal and get over her sadness. My brother on stilts interacting with the kids. We got up super early because it was a loooooonnnnnnggg drive to reach the largest juvenile detention center here. Traffic is insane because the street lights either don’t work, don’t exist or are taken as mere suggestions 😉 Anyway, it was well worth the drive! 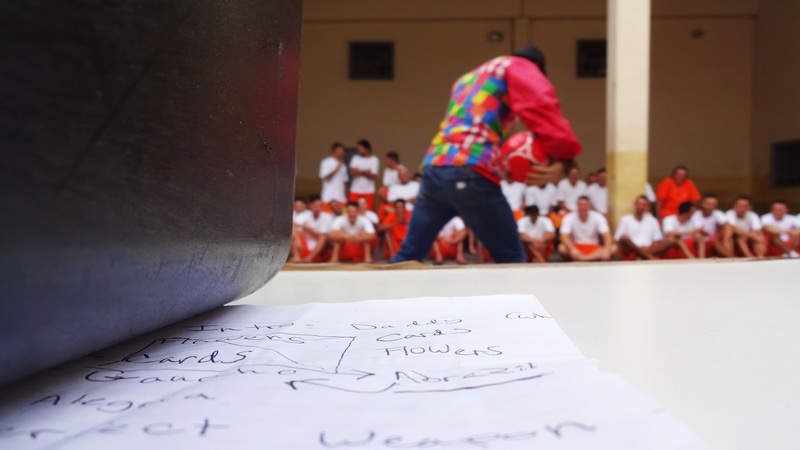 Excitement filled the air as the kids came out of their cell blocks and heard our music. Before they sat down they all wanted to come up, shake our hands and tell us their names. Here in this detention center, these young guys can have a sentence of anywhere from a few months, to 8 years. It really surprised me how teachable and receptive these teenagers were. 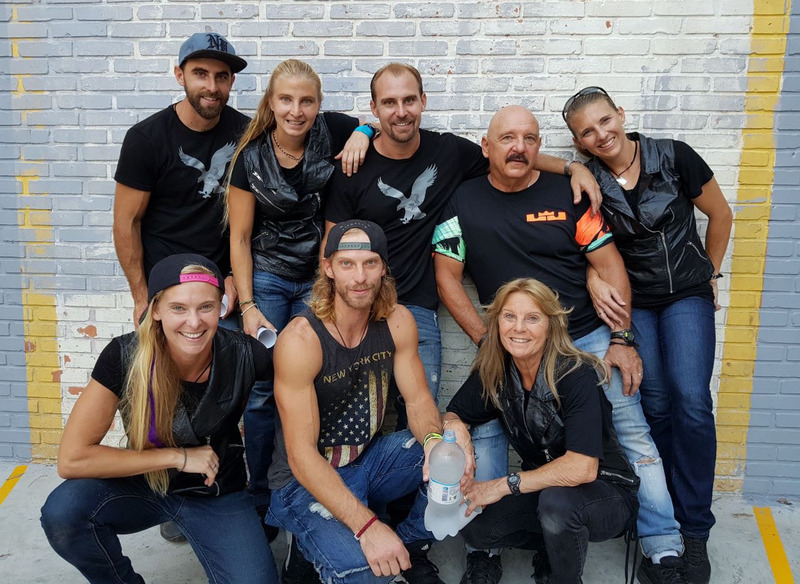 Often when the whole age group is in their teens, peer pressure can be strong and sometimes we have to be a little firm to get them to listen, but in this case, even though many of them looked like cool “bad” kids, they were just little boys at heart. One boy named Luis who was 16 years old, told us his dad left when he was 7, his mom died of cancer, then his dad came back, but was a drunk and died shortly after he came back into the boys life. He was in and out of foster homes and got into trouble. Many of these kids moms or aunts are now in the women’s prison (the one we visited). It was hard to leave this place. Every young man gave us the tightest hug and didn’t want us to leave, even the “ bad” kids, weren’t too bad to ask for a hug. One guy named David, pulled me aside and just asked, “How and why did you find us and come here? Of all the places, how did you find us?” He was so grateful and touched that they were not forgotten. 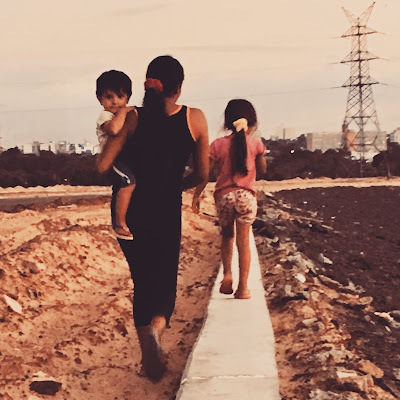 In another life, I would love to adopt some of those guys and be the mother they never had but I pray that God could use my life in this way to give them a seed that some, day, perhaps could become a tree. Having a water ballon toss at the juvenile detention center. 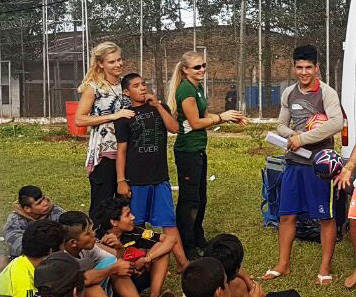 Awarding prizes after the games we held at the juvenile detention center. Weeks later we went back to this same juvenile detention center again to give the boys a very special party. 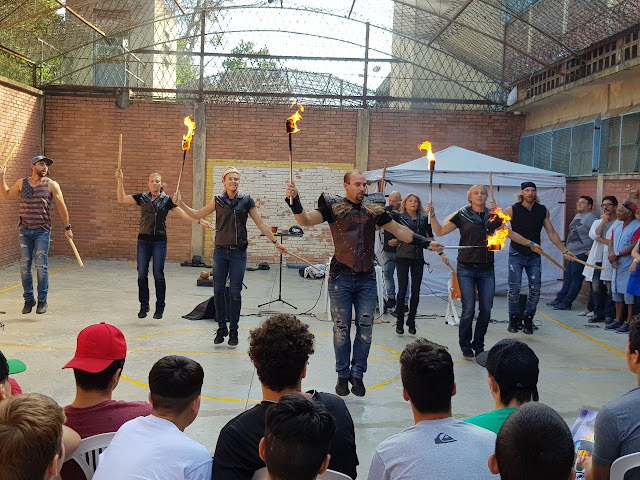 For a day, we transformed a prison, into a playground and even though they are here because the are criminals of some kind, inside, like all of us, they are children. 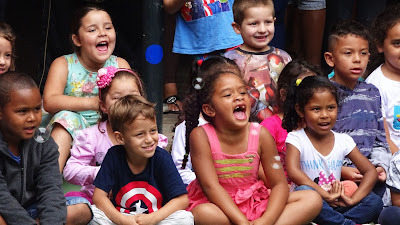 We wanted to celebrate their birthdays and let them have fun, so we planned some games, piñatas, a magic show and got some prizes and treats for them all. We divided them up into 6 groups, one for each of my brothers and sisters and I and made up teams with each a different color, name and cheer. We played dodge ball (super crazy and fun:)), had water balloon tosses (even though they all kept stealing water balloons and hurling them at each other so it was a good thing we had hundreds. Obviously the ultimate was for them to soak one of us:)), and had wheel barrel races and other games. Performing at a school for troubled youth. 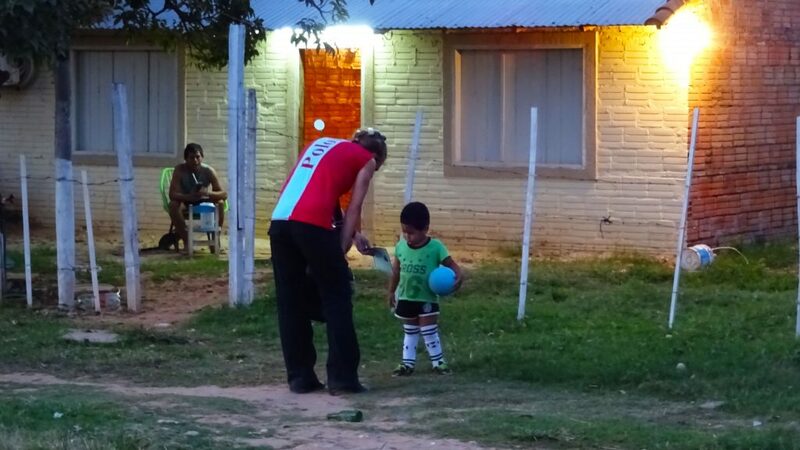 Between each game we would take time to sit down in a circle with them and teach them things to help them. Things that can help them get a job like how to give a good handshake, look someone in the eyes, how to speak loud and clear and stand up straight. To not make fun of each other but rather care about each other and look out for each other like brothers. We gave them ideas of ways they can help their community and fix things. We talked about drugs and asked them how much they would pay if someone asked them to carry drugs. Then we showed a picture of a horrible prison and asked them how much they would pay to get out of prison. When they answered they would give everything they own to get out of prison, they realized that no amount of money is worth running drugs, besides the risk of their lives. And we talked about how to focus and tune out all distractions to begin to read the Scriptures and seek Jesus on their own. We broke down the Gospel in a clear simple way and explained it to them. One of the many “neighborhoods” here. 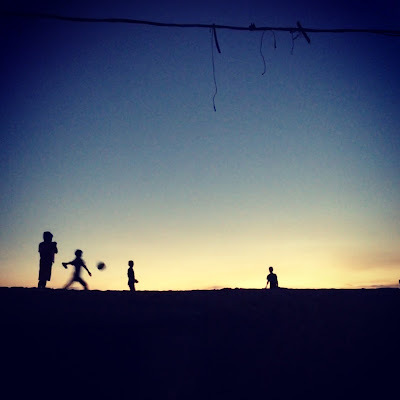 It took a lot of work to keep everything under control, to include the outsiders and kids who were more rejected, keep order, teach them, plus play with them. Breaking the piñatas got super crazy with big jam piles of boys diving for candy and having a lot of fun. Then we brought them all together and talked with them as a group and did a magic show. Many were in tears when we were saying goodbye and it was all over. Honestly, I was at the point of tears too and really came to love my “green team” of 16 boys who they named, “ Tacu” which is a slang way of saying, “ The misfits”. They just kept giving me hugs. The director and all the guards and staff were very moved and grateful to us. It was a very special day I will never forget. Spending time at a school for children and young adults with special needs. Speaking to the crowd after the race. We had been in contact with a school for children with special needs and we got to run a 10k race with them that was for their benefit. It went through the center of Asuncion and along the river. 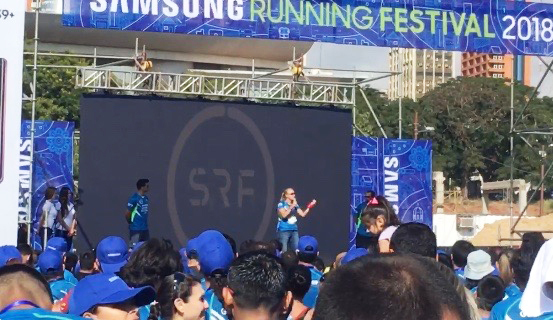 I was not in the best shape because of my leg injuries, but still ran it in 47min and it was fun to run the event with my family;) After the event as the runners gathered in front of a large stage for the prize ceremony, I asked the director if I could say a few words and he gave me the microphone:) I was able to share with the whole crowd, about 7000 runners how even in difficult times and times of suffering, God is a Father who will help us and that no matter what we have been through, we can talk to Jesus and He will be there. I was thrilled to get that opportunity to share with the whole crowd. My mom actually took first place in her category and stood on the center podium to get her trophy! I was so proud of her! 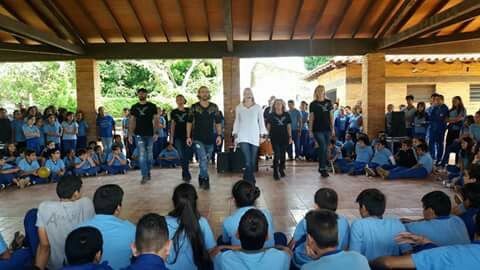 We later went to the special needs school to perform for and spend time with the kids. It was definitely one of the best days of my life:)! 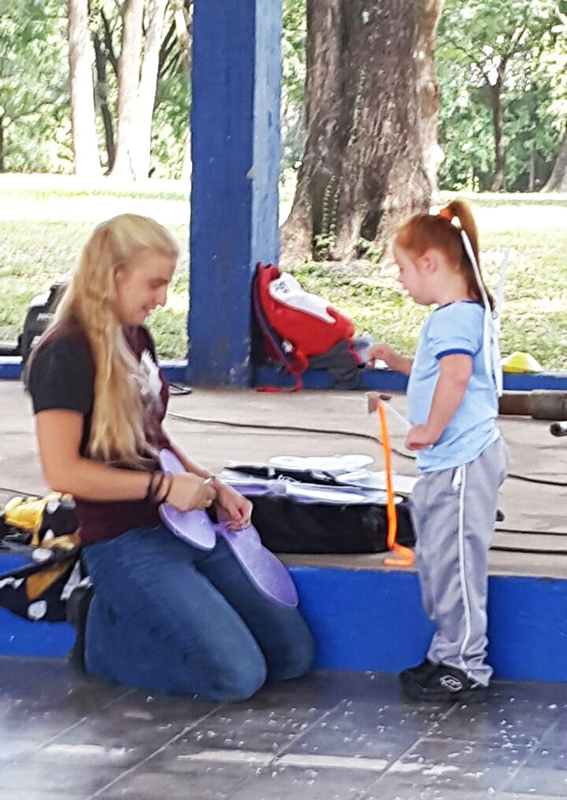 Even with all the challenges these kids face, down syndrome, autism, ceribal palsy, they were so precious and engaged. Many of them wanted to dance, sing and speak on the microphone. One little boy with down syndrome walked up and asked for the microphone. He took and it just said, “Jesus!” with his hand in the air. It was so beautiful. No word has more power. 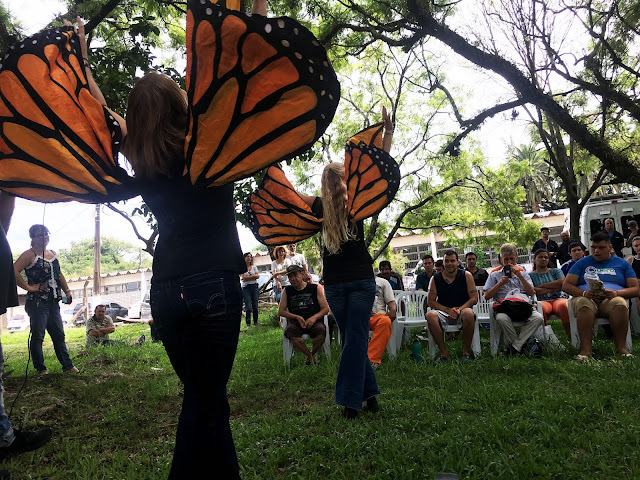 Putting butterfly wings on a precious girl with down syndrome. After we do our dance with the caterpillar who becomes a butterfly, pretty much all of the children wanted to wear the butterfly wings and dance (we have a bunch of sets of the small butterfly wings we bought on sale after halloween. We let kids wear them to participate, teach them a choreography and introduce them to the crowd so its really special for them, both at schools and on the street). The director of this school has worked here for 22 years and dedicated her life to caring for those with special needs in Paraguay. The government was trying to implement a rule that there would be no specific schools for those with special needs, but that all regular schools would have to make accommodations for them. 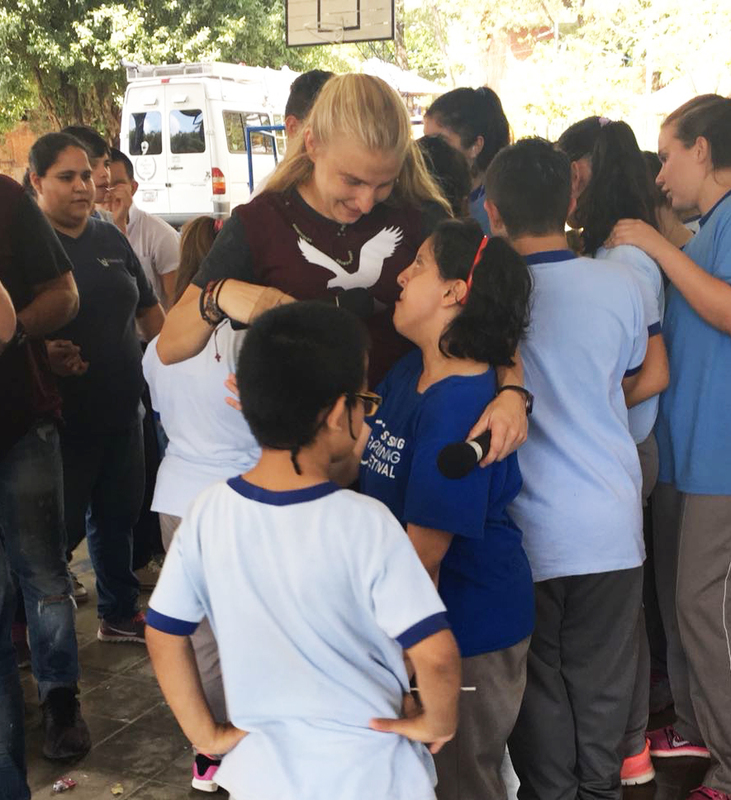 The director explained how this idea would never work and only make things very difficult for those with special needs, so she started this school and really loves these kids. It is really amazing what we can do if we just allow ourselves to care a little bit. 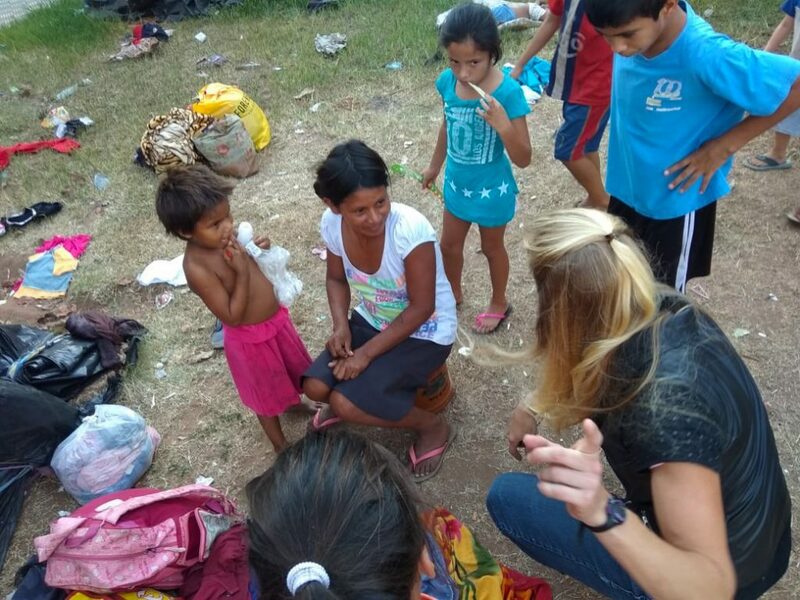 Talking and playing with the kids afterward is definitely one of the best parts:) This is Shanon in the picture talking to me. 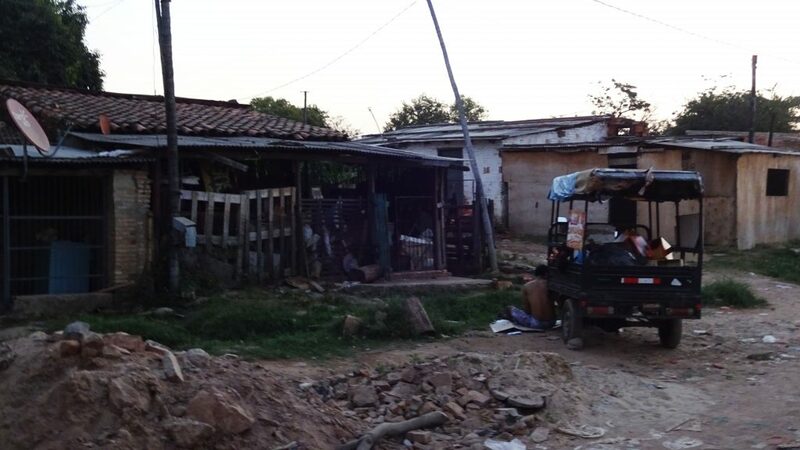 Another school we went to was in the poorest area in all of Paraguay and even the poorest in much of South America. Just getting to the school was quite a trip! 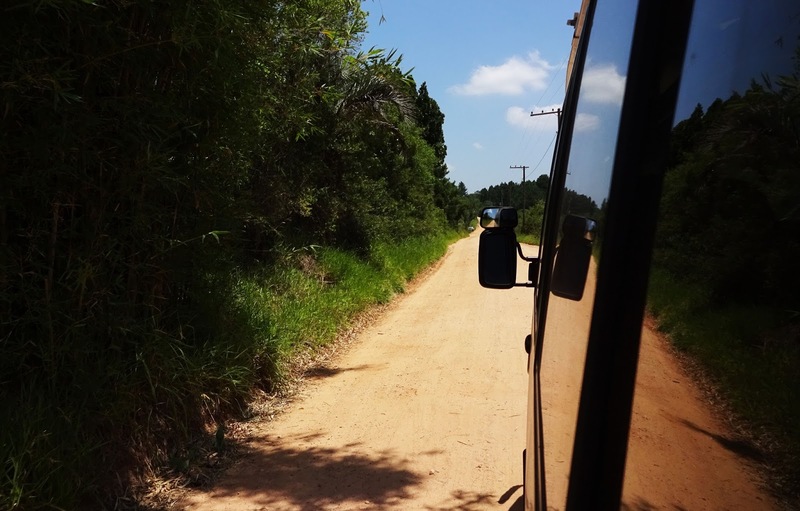 It was a terrible dirt road, washed out by the rain that was one lane but two way traffic with dogs, roosters and people all over. We almost turned back because it was not looking good and we did not want to risk our van, but then a little kids ran in front of us and we realized the school was just ahead. The teachers and administrators came out to greet us and help us unload. They were so warm and grateful it picked up our spirits. Maybe you saw a while back there was a 60 min episode about a school that built musical instruments out of trash. Kids would rummage through a massive land fill of trash and salvage things they could make into musical instruments. Well anyway, that story was about this village and we drove right by the landfill. This whole area is one of the poorest saddest places I have seen. At the school there were 600 kids and we did two presentations, one in the morning and one in the evening. Of course many of the kids never left, so we were playing with kids and performing for some 8 hours:) Yes, we were dead! Massive trash heap on outskirts of “city”. My sister does a beautiful ballet dance that communicates the idea that we can go beyond obstacles and reach for our dreams. She starts all wrapped up in a black piece of cloth and then slowly unwinds into a ballerina. She explains how we all feel trapped sometimes by our own fear, by others, by our past, by circumstances, but if we can reach beyond ourselves, and reach out to our Father, we can find a dream greater than we imagine. A dream to love others and care for those in need. The director explained to me that many of these children practically live here at the school, because their “homes” are nothing more than muddy shacks. They have nothing to eat there, nothing to do and if they have parents, their parents are in the center trying to work so they have no one to go home to. The director and the teachers set up a certain fund where they set money aside to buy food so they can send the kids home with something to eat and they can know that the kids got at least one meal today. Its really sad. She told me she acts more as a mother then a principle and I could tell she did. All the little kids wanted to be picked up and all the older kids wanted hugs and attention. One little girl was so precious, she walks over to me and gives me the cookie she got with her lunch. We ran into a lot of trouble with our visas and dealing with government corruption but God was with us and eventually we sorted things out. We will soon head back to Brazil and hope to work in the Favelas of Rio and Sao Paulo. The gang violence, government corruption and poverty are escalating and we pray the Father would open up doors and lead us how to effectively penetrate these cities with His love. Living like this and working at this pace definitely takes its toll. My brothers and I were talking with each other the other day about how after we leave a prison, orphanage or certain areas, we feel a lingering sadness that we just can’t shake. Even if everything went well and the people were preceptive, its like we feel their sadness and pain, especially in prisons. We are working hard to infuse hope, life, laughter and new thoughts into people, and as a result we take on their suffering and sorrow, we touch their pain. Plus there is always the feeling that you just want to do more, say more, care more and give more. At the end of every presentation we do there is always a rush of, giving things out, people coming up, talking one on one with certain people you pick out in the crowd who are listening, talking to the directors and organizers, people wanting pictures, flyers, bracelets and attention and it can get a little tough trying to keep up with everything. My parents don’t speak Spanish or Portuguese so as people come up to them one of my brothers and sisters and has to translate for them. I find myself literally running around keeping up with stuff, sometimes trying to talk to one person while also translating for my dad:) But I wouldn’t trade it for the world and it is such an honor to effect lives in this way. Driving home in the evening after a prison. Its always the things I regret that I afterward think on the most. Like the guy that asked for something and I forgot to get it for him, seeing a prisoner have to leave before I could give him something to read, realizing I started sharing a thought but didn’t conclude it, realizing I said a word wrong in Spanish or Portuguese and hoping they understood it, remembering a certain sad face that I wanted to go talk to and didn’t get there, or messing up on a certain routine. The other day after a prison, a really old, frail man asked me to give him any little thing as a memory. I had nothing left on me and told him I would go find something in the van. I got delayed translating for my dad and by the time I got back the guards had taken him away and I felt really bad. Still bothers me. I just hope and pray that the Spirit of the Father would go behind me and cover all my failures. I pray that Jesus would use the little I do to draw people to Him and I know that He knows, I am broken. It is only Gods profound mercy and grace that sustains us and His Word that carries us and gives us life to give. 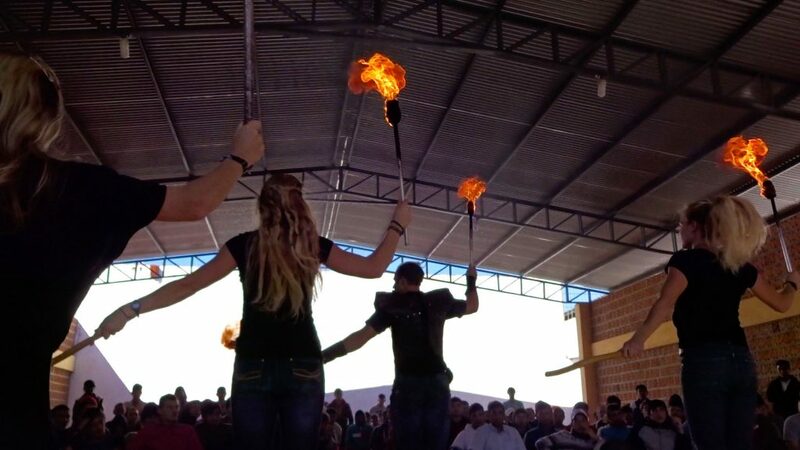 Performing a choreography with fire, Capoeira and drums. We are all tired and many of us are fighting a flu type sickness as well as various injuries, but beyond everything we have to deal with, God is so good and there is no greater joy than seeing Him use us to touch others. We all seek for purpose, we want to matter and leave our mark on the world. I promise you my friend, if you would surrender your life to the hands of the Father and let your “seed”, break, you would find a purpose and a joy beyond anything you could imagine. Study Jesus, all by yourself. He knows you. He knows you are broken and knows your past failures. He is not waiting to meet you in a building, or meet you after you get your life in order. He is waiting to meet you right where you, to meet you on the ground of “broken”. The ground where there was a hill called “Calvary” and a cross. Because it is there, at the place of absolute death, where we can find absolute life. Indeed, the place called, “Broken”, is a beautiful place. The week before we left Brazil was super full:)! We presented at a different place every day, sometimes two a day. In one of the days, we drove three hours away up into a mountainous area. It was a long drive down a narrow windy road and we came in and out of rain storms. We finally found the prison which was buried behind a small town. The workers were expecting us and very glad to see us. The temperature at this higher elevation was a bit cooler so that was really nice for a change:) One man named David, told us that he had been set up to take the fall for a crime. In it all he was hit in the back of the head with a 2×4 and left for dead. He showed us his scars. In a song we share we have the words in it, “não desista” (don’t give up) and at the end he told me how much that meant to him. We had a beautiful time visiting and performing at a large home for the elderly. It was so cool to see these beautiful, but sad people, slowly warm to us and then accept us like their family. The director of activities was a 17 year old girl! She was mature well beyond her years and really cared about the people she worked with. Her mom had died when she was 11, her dad just left and her grandparents were raising her. Seeing the kindness of her grandparents, gave her the desire to work with older folks and choose to lay down her life and love these people. She had a very selfless beautiful attitude. She told me that 90% of the people in this home get NO visitors! Someone drops them off and forgets them. The home, which is Catholic based, pays for all the expenses including their care, food, and clothes. This one man named, Theo, was really beautiful. At first when he came in he was really grouchy and even angry. But after a little “magic” and just talking to him, he became my best friend. He lost one of his legs in a hit and run accident years ago. As I pushed his wheel chair, he took me on a tour of the place. I gave him a chess board and we sat down and played a game. Love really is a weapon. Even a tiny amount can change a life. We have to always make an effort to remember the forgotten and love the unlovable, just like Jesus did. If you even make a simple effort to say, go visit the elderly, or boys and girls club, or homeless shelter, you will take away as much as you give. I imagine you have some kind of talent you could use to approach people, maybe you can play an instrument, sing, use a card trick or puppet or just your personality. The best thing you can give others is to give yourself, and let God use yo to show His love. The best thing I ever did with my life, was to loose it (Jn.12:25)! We had to go up and down a hall as some of the people at, here at this home for the elderly. We had to go up to each table and engage them one on one. They were really beautiful and listened. On my youngest brothers birthday, we visited a juvenile detention center and did two performances for two different groups. Both times we really got through to the kids. My brother was blessed to share the day caring about these young men. 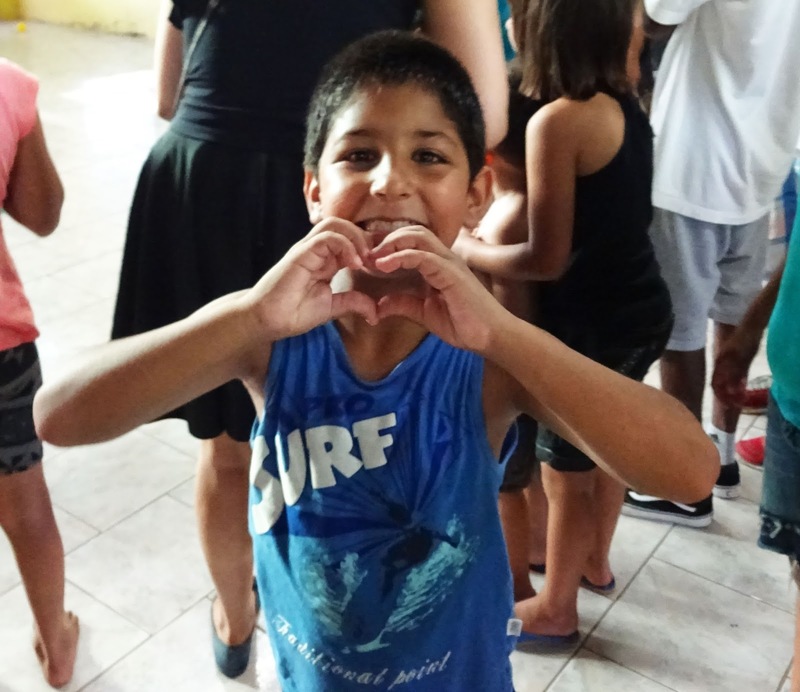 Many of the kids have come from broken families, had no parents or been through a tragedy. We were able to reach a lot of really beautiful young people and give them some real direction. They were quick to learn, ask questions and participate. It was like they were just starving for love and attention. 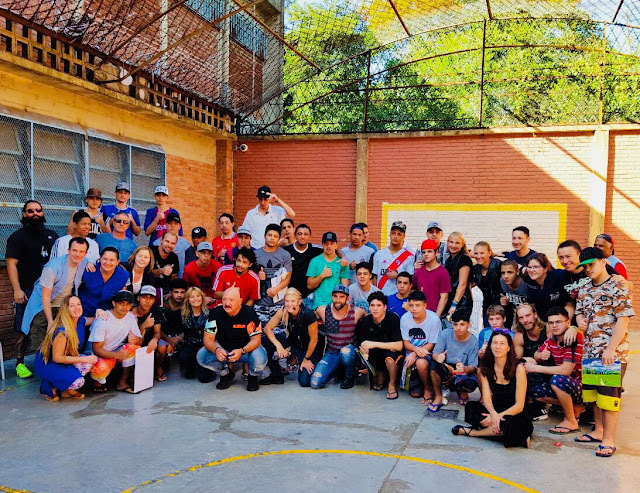 My family with a group of the kids and staff at a juvenile detention center. We made a color flyer with a cool car on it and use the example of a car, to teach them how they have to start their mind (think), shift into gear (make right choices) and drive their life (short version of a detailed and helpful example;). No one can drive our “car” (life) for us, if we are distracted by peer pressure and all the voices of the world, we can “crash”. We communicate these ideas through a theatrical act, and large colored posters as well. It is something that really relates to this age group and they really get it. 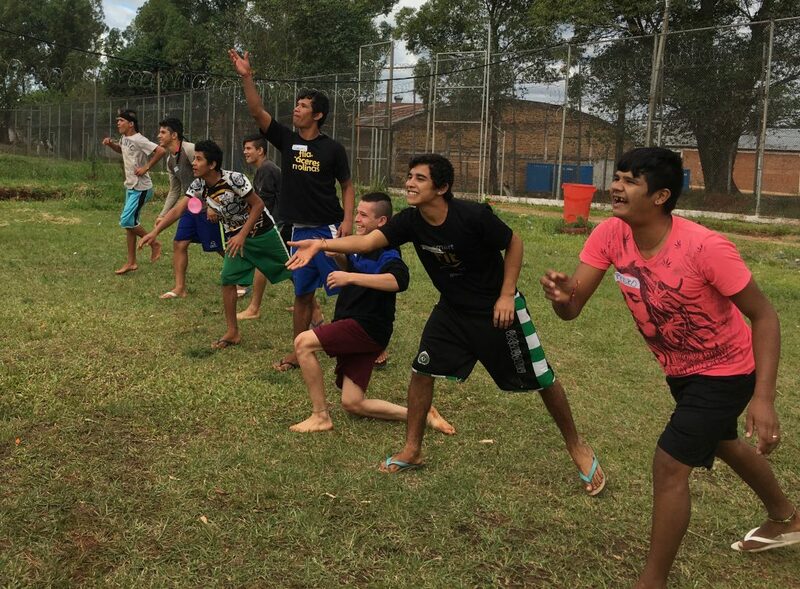 The way it works here in Brazil is that minors, 17 years and younger, cannot be tried as adults or receive a long prison scnetence. So big time gangs, recruit these kids to commit serious crimes knowing they will get less time. It is tragic what some of these kids, who are really mere children, have done and now have to figure out how to deal with. After our performance, many of the guys came up and just wanted to tell their stories. One guy named Lucas, had just watch his mother die in the hospital. One guy had just had his right eye shot out by a cop who was chasing him. One kid had 7 brothers he was raising. 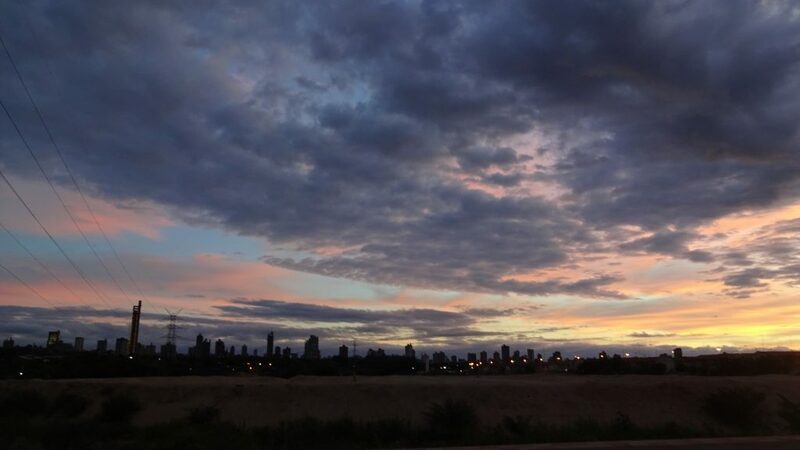 Many told us that we had changed them forever and they were going to leave the gangs, maybe leave this city if thats what it took, and that they wanted to do good with their life. The director told us that in 15 years of working there, and seeing other groups come in and talk to the kids, he had never seen anything like what we did. He said we were the first people he ever saw “speak their language”. That is why we use cool music, do a little rap, cool magic ecs, so that we can “speak their language” and reach inside them. We did a total of eight presentations for different groups at different youth centers in the city. Its really awesome when it works out and we can go back to visit a previous prison. All the prisoners have had time to read the material we give out and think about all we shared and now they get the chance to ask us any questions and engage in conversation. We keep track of what acts, magic routines and dances we did the first time, and do all new things the next time so they get a whole new show. We usually re-visit a previous patio, and then go to a new one as well. 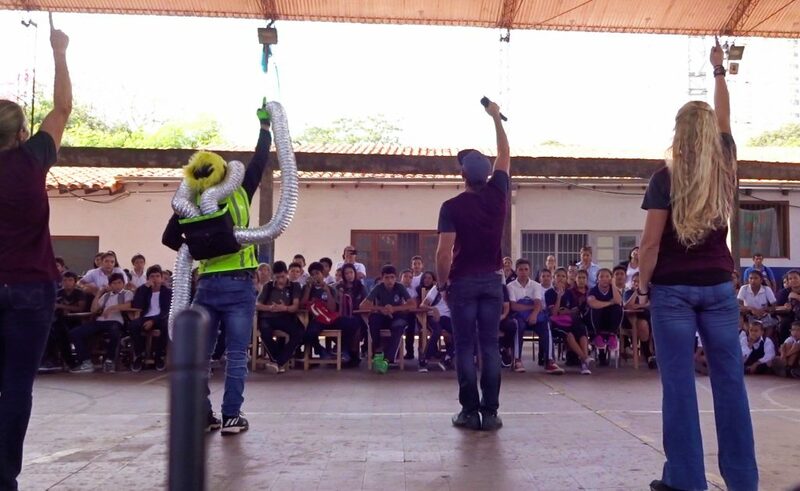 An act where we use a net to communicate all the things that can trap us in life. Only by engaging our freewill can we break away and find freedom. We worked extensively in the largest prison in Brazil. In this one patio we went into, it was one of the worst we have seen. There was trash everywhere (because they are not allowed bags or anyway to deal with trash), open sewage, and the walls were covered in mold. My heart just breaks for these guys suffering these conditions, some for many years. Many have never even stood before a judge or gotten a sentence! 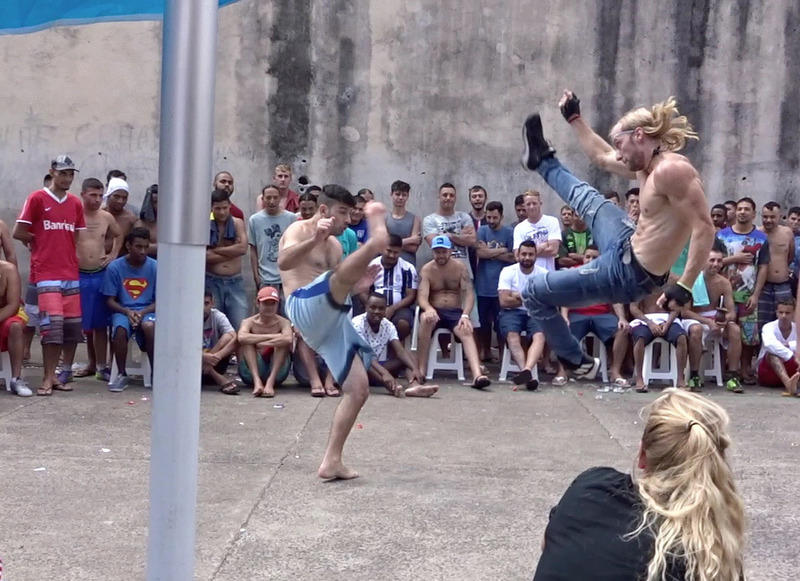 A lot of the guys knew Capoeira (the Brazilian martial art which is a combination of dance and fight) and were so excited to participate! One guys said, “wow, thank you! It gives me goose bumps to play these Brazilian instruments again! 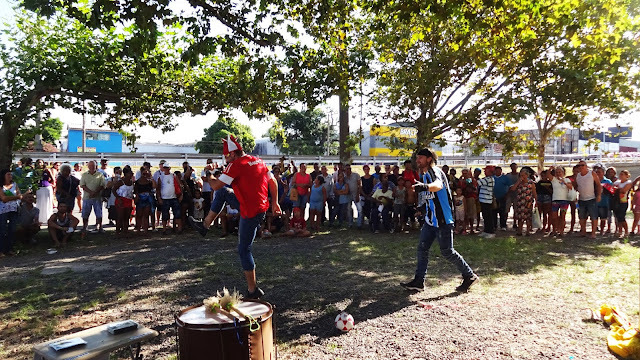 (We let them play the drum and percussions)” Doing Capoeira brings a lot of energy into the whole crowd so everyone becomes more attentive to listen to all we share. My brother “playing” with one of the guys. Seeds are those things in life which can seem so insignificant, but end can end up being very big. Like deciding to love a little more, making someone laugh, changing one thought or attitude, talking to the Father in a deeper way, spending a little more time reading the sacred scriptures, these are “seeds” that can grow into massive trees. When we arrived in the patio of a certain far coastal prison, we noticed right away that something was wrong. All the guys were unbelievably thin, way more than any other prison we had been too. It looked like something you would see in Africa. They began to come up to us and ask us if we possibly had any food we could give them! It was just tragic. They explained they only got one meal a day and sometimes not even that. We could not figure everything out, but realized that there was some serious corruption going on between the gang leader, prison guards, and a huge (very evil) “church”. Anyway, long story short, it was getting late and was almost the hour when no one can go in our out, but we were able to leave, find a grocery store close by, and buy a lot of food to give them. We made it back a gave it directly to the guys so it could not get stolen. Its tough because we can’t really afford extra stuff like this, but in this case we just had to and we know the Lord always provides. A week later we went back to that same prison and brought more food as well as our performance. The previous day my sister and I went to the local fruit market and talked to the sellers. We were able to get a bunch of fruit, potatoes, watermelons and beans donated to add to the food we were bringing. The prisoners were so grateful we remembered and came all the way back with more food. We did two performances here again, and reached a lot of guys. No, you are right, watermelons is not exactly the most practical thing to bring into a prison:) but these guys had specifically asked for it so we decided to bring them some this time. 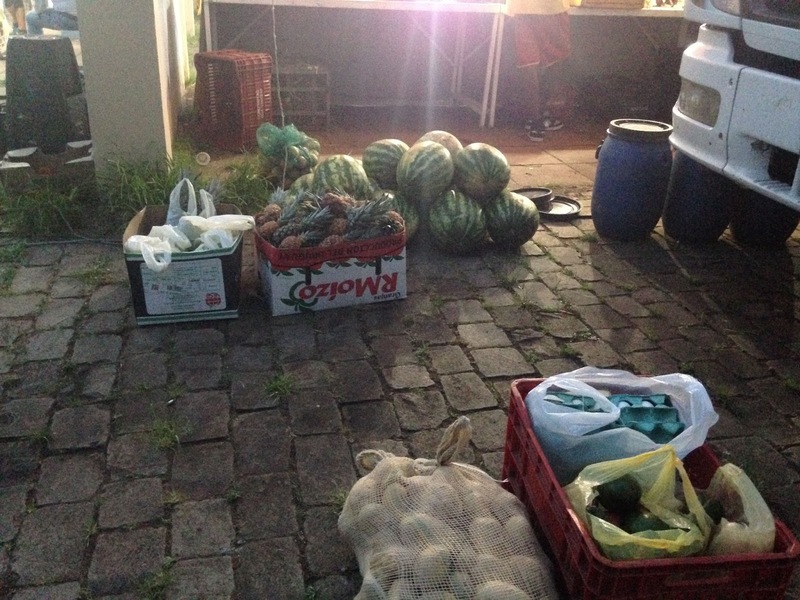 But loading 30 watermelons into our van, out of our van, through a scanner (to make sure nothing was inside), off the scanner, onto a cart and then into the patio was….well….fun:) Plus this same process for EVERYTHING else we bring in and out! My sisters and I do a magic routine that is about time (obviously this is such a big issue for people in prison, especially those with long sentences). We use different tricks to communicate how time can “disappear” and if we spend our time thinking about the past, or things we cannot change, we merely waste our time and keep ourselves living in the past. Time can also move so slowly, and trap us like a like a bird in a cage (we keep this theme through the routine). But if we invest our time to do deeper things, things that are important, like talking to the Father, love others, study, think, then we can find a time beyond time. A time that is eternal. We make a bird cage appear that is empty. Then my sisters comes our with beautiful wings on as the “bird” free from time. Its hard to explain writing it out, but it communicates a lot and we perform it to a high energy rock type song the guys love. 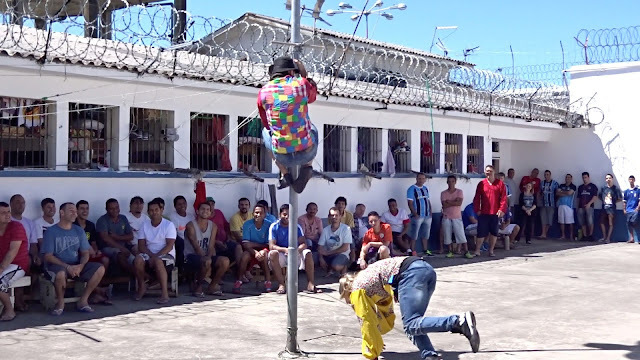 My crazy brother really made the prisoners laugh in this one prison when he climbed up a pole to get away from the angry “dog” that was chasing him in a clown routine:) There were about 250 guys all spread out along the wall, all of them were really engaged and listening to all we shared. I felt so bad for this older man who had lost one of his legs in a hit and run accident years ago. Imagine dealing with the hell of prison with one leg! We do a traditional Brazilian dance called a, “Gaucho dance”. It is a song and dance they all know where we wear beautiful skirts my mom made and the boys wear cowboy hats. They all sing the words to the song and join in the dance. It means a lot to them that we do something from their culture that they grew up doing:) It reminds them of growing up on the countryside. “This date will surely be remembered in my memory and in my heart. 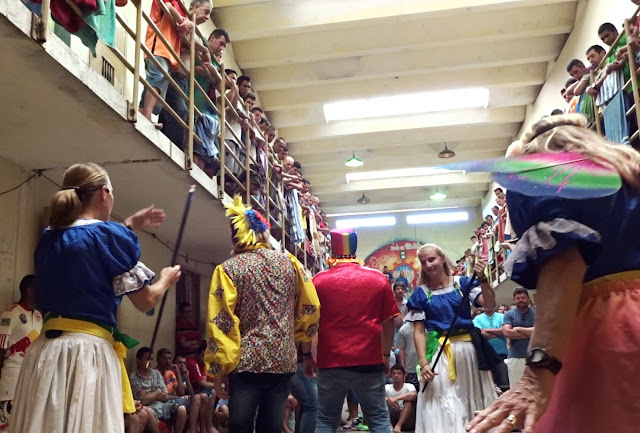 the day that a group of Americans who might even call them angels, have arranged to come to a penitentiary, where much of society wants to stay away, to give their personal testimony, to present themselves theatrically and to demonstrate knowledge of the culture of our state. I wanted to thank everyone without exception. I’ll introduce myself to you just by my first name. My name is Alexander, and I wanted to make you who made this day the best day of the approximately 242 days that I find myself secluded here in this Catcher’s penitentiary. You have been able to awaken in me something, that perhaps I had no more, that is hope. God has bigger plans for me. I could be writing about you several pages, but I will abbreviate my words in a simple and simple Thank you !! This picture and the one below are the same prison. Most of the day the guys have to stay inside their cells. Well I am going to sign off for now my friends, I have to practice a new magic routine with my sisters and get ready to go out tonight:). 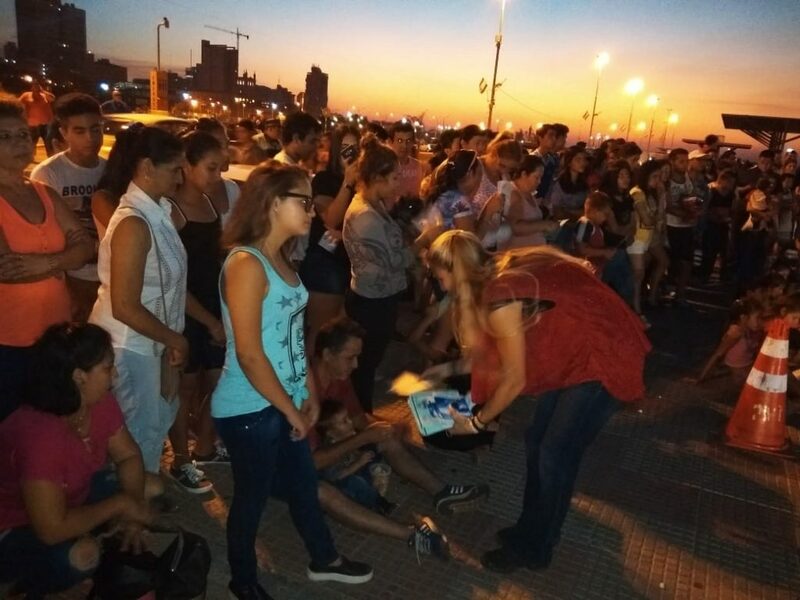 This Easter weekend here in Paraguay there is a boardwalk that is really busy in the night. I pray the Lord my God would bless you each, and that you would look to Him, learn from Him and allow Him to carry your burden. May we never think that “we have arrived”, “been there done that” and now have God in our “box” and we’re all set. In presumption we will fall, but in humility we will rise and grow. The God who rose Jesus from the dead will never fit in any “box”. The heavens are His throne, the earth is His footstool (Is.66:1). This Easter as we enjoy certain traditions and ceremonies, may we more than anything focus not on who Jesus was, but who He is. Because He WAS dead, but He IS alive and He is worthy of our lives. His love and forgiveness are as deep as the ocean and high as the heavens. He is waiting to come to you and help you. Let us be humble, be a children and talk to our Father. The same power that called Jesus out of that tomb 2000 years ago, is there for you and I to access in our personal lives. A power so real, so strong and so practical it can change our life and then through us, change the lives of others. Don’t hold yourself back guys! We are our own worst enemy. Don’t let routine hold you prisoner and keep you from discovering the life God has for you. The Rising Son (part of a poem I wrote). Resurrection blood now fill my vein. Come dancing dawn it’s time to break. Great is thy glory on this third day. For I shall be the plague to death! Oh stone that holds me now roll back! If you want to matter, matter to someone else. Life can be such a fight at times can’t it? Nothing comes easy and sometimes it feels like no one really cares. We can feel like we are lost at sea, just trying to survive the “waves” and “storms” of life. Sometimes we feel like we just really don’t matter. But you do matter my friend. You matter very much and most importantly, you matter to God. He designed the entire plan of salvation because He wants you to know Him. You are not just a number out there, floating in a sea of humanity. You are unique, special and beautiful. There is no one like you on earth. Look in a mirror and stare into your own eyes. Those beautiful eyes are proof that God exists and that He is good. God is not distant from you, even if you feel distant from Him. He is near you. He is not an abstract cloud or doctrine. He is a Father. He sees you, knows you and knows your pain. If you could truly realize that are loved by God, it would enable you to forget about yourself, and begin to love others that are suffering. If you could realize how much you can matter to someone else, it would make your own struggles seem smaller and you would realize just how much you do and can matter. 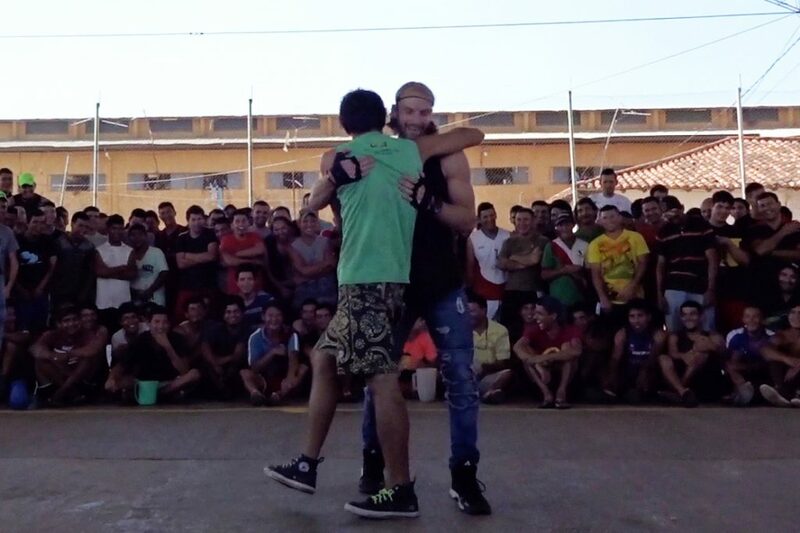 Here in Brazil my family and I have been continually working in the prisons, on the streets, with the homeless and at special events. God has opened many doors for us and we have been reaching a lot of people with His love. When I talk about prisoners, I imagine that many of you have the same attitude that I used to have. You have a thought like, ‘prisoners are criminals getting what they deserve, why give them special attention’? And of course, there are many serious criminals who have done horrible things and deserve to be in prison. But if I could just communicate to you what I have learned, I think it would give you a new perspective. First, many of these guys really are either innocent, or just committed a petty crime like a parking violation, or overdue bills, they can’t pay a fine, so they get thrown in prison and lost in an unjust system. Their paper work gets misplaced, their identities confused with other criminals and since they cannot afford lawyers and no-one cares about them, they just get lost. The majority have never stood in front of a judge or received a sentence yet they have been in prison for years. I know this first hand and have talked to many prisoners, family members, press, guards and officials in the prison system who have told me many such tragic stories. 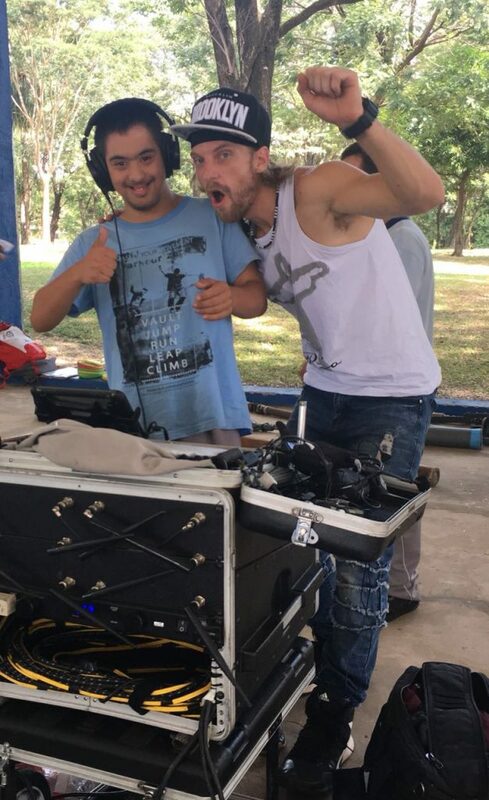 My brother and I in a large prison here in Brazil. Second, most of the prison conditions here are inhumane and not fit for animals. 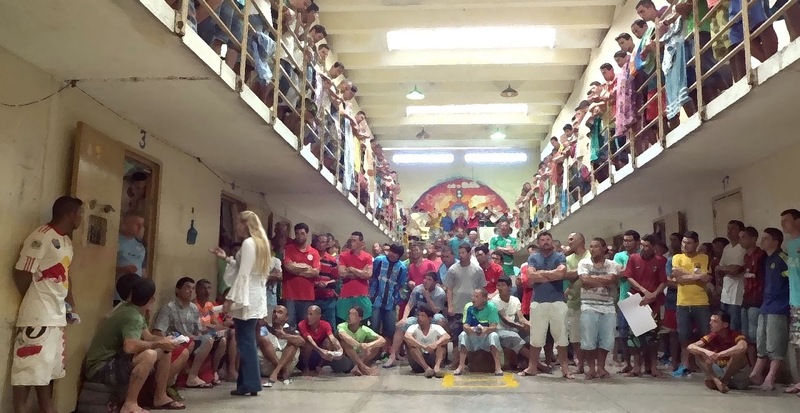 They are so overcrowded that at times, the prisoners don’t have space to lay down. Since the government does not care, and they are the least priority on the social scale, they get no funds and there is not enough food, health care or basic necessities. In certain prisons, there is no sewage system, drinking water shortages and severe structural damage that is dangerous. Third, when you think about it, in the right, or I should say wrong, circumstance, all of us are just a mistake away from being in their position. Anyone of us could accidentally hit a pedestrian with our car, get so angry we throw something at someone and severely injure them, loose our job, end up on the street and be so desperate we steal to feed our family. So it is wise, and gives us compassion to consider this perspective and realize that we are all the same. We are human. We are fragile. We fail. We say, think and do things that we regret, sometimes there are no consequences, sometimes there are tragic consequences. And the last point to think about is that beyond our personal opinion, or what we think or feel, Jesus Himself said, “I was in prison, and you came to me…whatever you do to the least of My brothers, you do to Me..”(Mt.25:35) And again God say, “Remember the prisoners, as though in prison with them, and those who are ill-treated” (Heb.13:3). My youngest brother built this cool electronic contraption. them because he has it timed to the music. He conveys an idea about using our freewill. 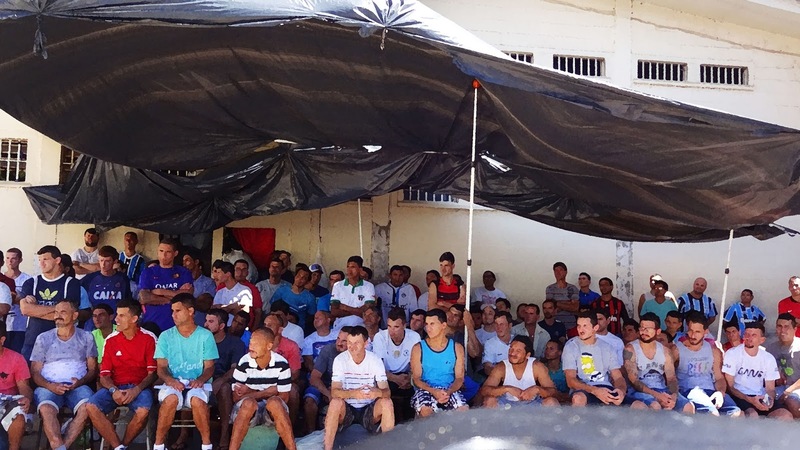 We frequently visit one of the largest and worst prisons in Brazil. One day, when we were scheduled to visit, a certain patio, a part of the building structure had just collapsed and a major sewer pipe had broken. All the guys had to bring their stuff onto the outdoor part to try to clean it and everything was a disaster. The smell was just horrible. 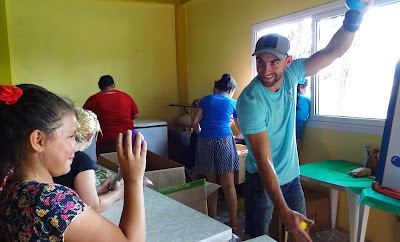 But the men had been anticipating our visit and really wanted a break from the nightmare that is their usual reality, so we decided we would figure out how to work around everything so we could give them a little laughter and hope. We arranged a certain area for them to sit and then brought all our equipment in. Its like as soon as we turned the music on, they got to travel to another places and leave the horror of these walls. We made them laugh a lot which makes me so happy. We do an act where my brother wears a mask with many faces on it. (it looks really cool because you can’t tell which is the front when he turns his head). Each face has written a word like, “the Past”, “Regret”, “guilt”, “failure”. In the act he comes to the Word, takes off his mask and gains perspective and focus. Its hard to explain but really effective. The prisoners were so very grateful and asked that we return some day. Later, the director of the entire prison wrote an article about us on their webpage explaining that the work my family and I are doing is having a very big and positive effect on the prison and that the doors are always open to us. This was a great blessing because to enter here it required a lot of work and convincing because of the gangs and danger. Clown routine about a crazy dog and a soccer player that looses his ball. Its hilarious! We use the jerseys of the local soccer teams so the crowd is divided in a funny way. 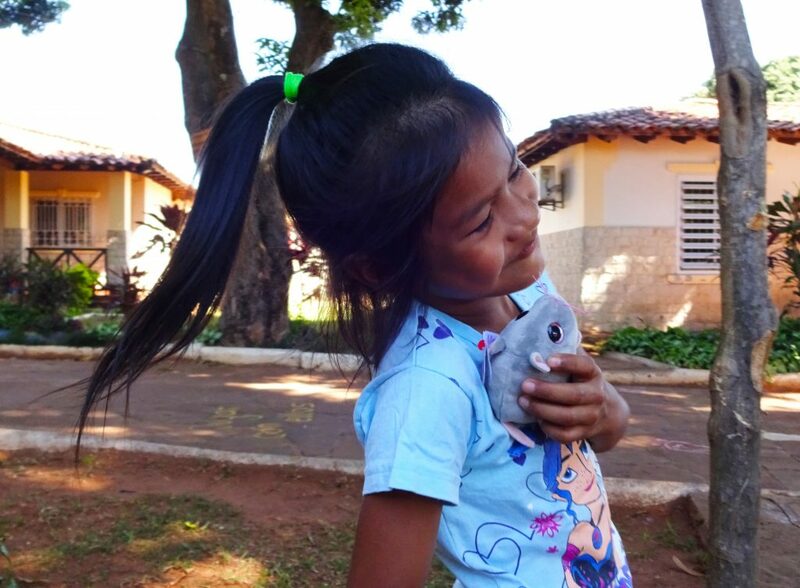 I want to thank the toy company that donated the awesome toys and plush animals that we use as prizes for so many families that have nothing. It means so much to be able to give some of these beautiful poor children a little toy. We got the chance to perform at a really cool Catholic festival down town. So many families and people from all the surrounding cities came to this festival. Some to participate in the religious ceremonies, but many came just to get out and enjoy the holiday. We had a good spot in the shade so a large crowd gathered and stayed a long time. We were celebrating my dads birthday so it was extra special:) I even got the crowd to sing him happy birthday. My parents have been married almost 40 years and so they teach a lot of things that help other parents raise their kids and keep their families together. It is the love of the Father that can heal all our pain and make a family strong. A key to getting past arguments and mending relationships is something very basic but rarely done. We learn it in first grade, but sometimes as adults, our pride gets in the way. Just saying the words, “I’m sorry”, even if you know your not wrong, can quickly diminish a situation and put an end to conflict. I really think that so much heart ache and even divorce, could be avoided if one party could just bite the dust, be humble and say those magic words, “Hey, I’m really sorry…its my fault. On another note, anyone see a minor problem with this picture:)? After a bad storm, all the electricity went out for our entire neighborhood. So just imagine, no one, including the local stores, has refrigeration, air conditioning, lighting ecs. and they are looking to the government to fix it. Then after a few days, these three guys show up with a tool box and one free standing ladder, which they lean against the shorted out wires they are “fixing”. Check out the guy at the bottom, “holding” the ladder. I guess if the ladder started to fall, he would….catch the guy? It’s kind of funny but really is just one of many things that shows how hopeless the situation is here and that the people get no help from their own government. We threw together that shade structure so the guys wouldn’t get to hot in the direct sun. We visited this one prison waaaaaayyyyyy out in the middle of Nowheresville. I don’t know if I have yet seen such a forsaken place as this prison and the town that it was beyond. First we could not find it and got lost with our google maps constantly saying, “Make the next legal U-turn”… Yeah no duh! Finally we found someone who told us where to go and we had to drive miles down a really bad dirt road. There was no one around and even the guards at the gate had the attitude of absolute hopelessness and despair. We had to explain again why an American family drove all the way out here and was trying to get in. Once we finally got into the patio, it was all in direct sunlight and burning hot. There was no way the prisoners were going to enjoy watching us while sitting in the burning sun so we had to figure out something for shade. They had a big piece of plastic, and we had string and a bunch of poles, so we all worked together and figured out how to rig it up tying it from the cell windows. It was tough because it was a windy day but we figured it out and they were so grateful. Guards were not allowed to come in because it is just how it works with the gangs here, so it was just us and them. I love it when my brother gets a volunteer for a card trick. 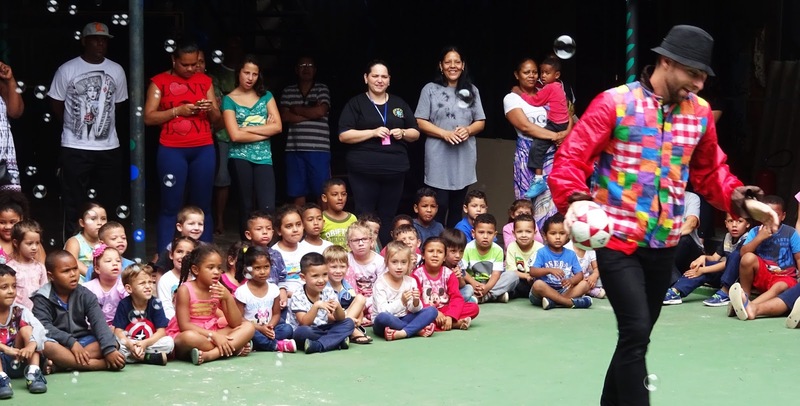 The volunteer gets to wear a microphone and really gets into being a magician and having fun. We do different things that allow them to get up and participate, they get a prize and it really gets everyone involved and engaged. We are working very hard to reach them. He met a man named Joao, who was serving 30 years. He saw his sister being attacked and in his fury, accidentally killed her attacker. He was a big time gang leader. He told us not a day goes by where he does not regret things he did. After we shared with him, he told us for the first time he began to understand forgiveness. My brother doing a card track where one of the prisoners volunteer and end up “doing” the magic trick. 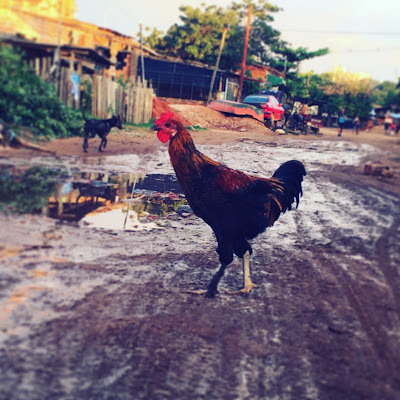 We go down town to the streets often, sometimes at the end of a busy work day. There is always a “rush” in the evening when everyone leaves the city to go home. The bus stops are just packed. We are able to reach people from all walks of life, both rich and poor, old and young. As well as just constantly talking to the crowds, through our performance we weave in the many beautiful truths of the Gospel. The need in this country is very great. There are so many new strange religions, churches and teachings here. Its like thirsty people drinking cool water when they hear that we are giving them the traditional, Scriptural message. A Father, sent His Son, Jesus, into the world to bear our sins. He died and rose again and offers eternal forgiveness not based on the works we do, but on faith in what He did. My brother spinning fire at the climax of a Tae Kwon Do dance we use to teach the importance of discipline and focus. Our crowd constantly changes over and some people stay for hours so we are able to touch many, many people in the three to four hours we are down town. We have different acts that are geared to different people so that we can grab them as they walk by and put some solid thoughts into their minds. 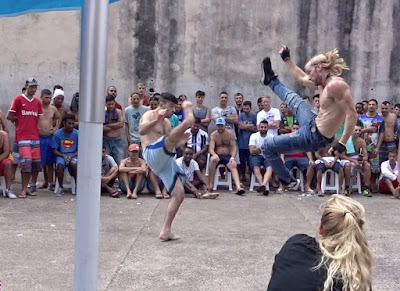 The martial art of Capoeira is popular here since it originated in Africa and was brought to Brazil by the African slaves. We tell a story about a man, who became a slave, to free the slaves as Jesus did to free us. We act out the death and resurrection in a really cool, non religious way to upbeat african/Capoeira music that really moves people. We always bring a lot of lunch packets to give to the many homeless and hungry that walk by and sit in our crowd. Some of the poor people know we always have food for them and are so grateful. 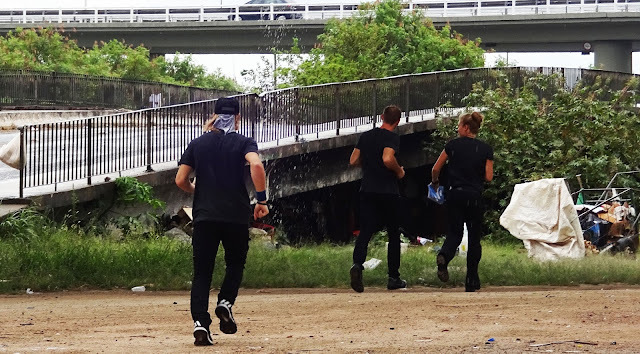 My brothers and I jogging over to help a family that lives under the bridge. There are just so many homeless on the streets and in the parks here. The rains can be very severe and flood the streets. The homeless suffer greatly and it is very hard for them to find shelter. We make up hundreds of lunches and care packages and then walk and drive the streets giving them out and talking with the people. Thank you to the companies that donated rain ponchos, and sanitary items to us that we use to help so many people. It is amazing how even the simplest things like soap, a tooth brush, or a nice rain poncho, mean the world to someone. May God really bless and repay those that decided to care and act on behalf of those in need. So many stories of suffering and tragedy. I wish I was rich and could help them in greater ways. I wish I could afford to get them a room sometimes, or new clothes, or constantly feed them but I can’t. 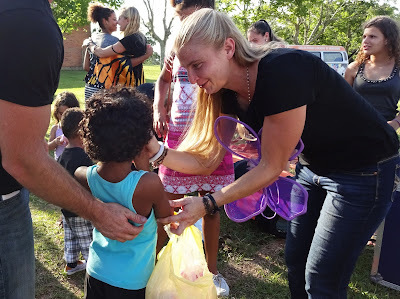 But like the apostles of old said, “Silver and gold I have none, but what I have I give you….” We can always give our time, heart and care about them. So many of them never even hear or speak their own name because no one cares and they have no one to talk to. It means the world when you ask them their name. Keep this in mind next time you walk by someone on the street. Just stop for a second and ask them their name, tell them not to give up. We visited a psychiatric facility. All the men suffer from mental disorders to various degrees. Some minor, and some severe. Many of them had the mentality of a child, very simple and just wanting attention. They loved to paint and wanted to show us all their drawings. Some of them were almost completely normal, just something was slightly off in their brains. These guys would tell us how hard it was to be at this place, surrounded by others who had serious issues. Its like they have to fight to keep their sanity. 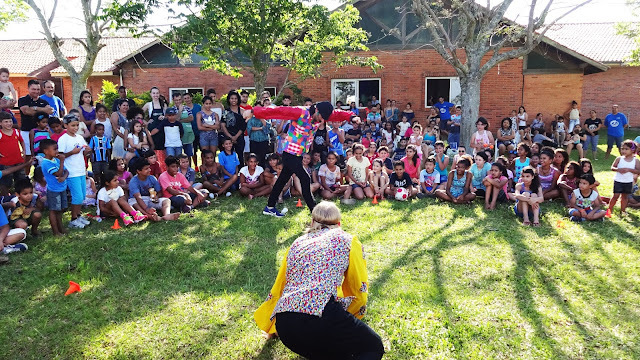 There was not a very good area for us to perform, since the whole building was very run down, but we were able to find a little spot out on some grass. They brought out groups of men and we were able to share many simple, but beautiful things with them. They really got the idea of the butterfly coming out of a cocoon. At the end one man, named Paulo, was actually brave enough to ask for the microphone and thank us in front of the whole crowd. He shared how he had never gotten a visitor and that his birthday was in a few days and us coming was the best gift he could get. It was really touching and the director and social workers were so shocked that he was able to speak like this in front of everyone. Here we could only do small groups at a time, so we would do a few things, talk to the guys then switch the group over. There is a relatively new prison that was built to accept prisoners from some of the over crowded prisons, but it is filling up so quickly that it soon will become over crowded as well. We performed for a group of young men. At first, they were very skeptical of who we were and what we were going to do. Often times evangelical preachers will come in and just preach at them and they dread that. Some of these preachers actually tell the prisoners they need to tell their families on the outside to tithe the churches of these preachers! Sick, I know. 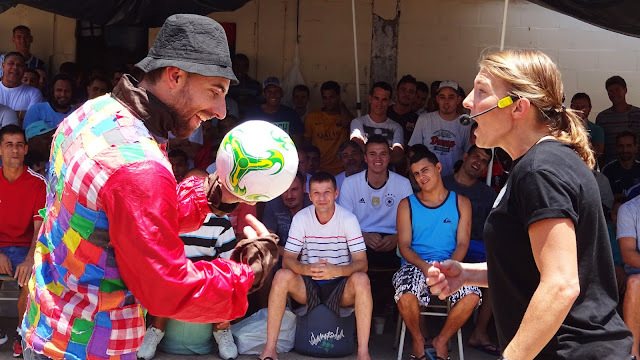 Anyway, after we did this hilarious clown routine about a “soccer player” and a “dog”, they were laughing hard and all with us. 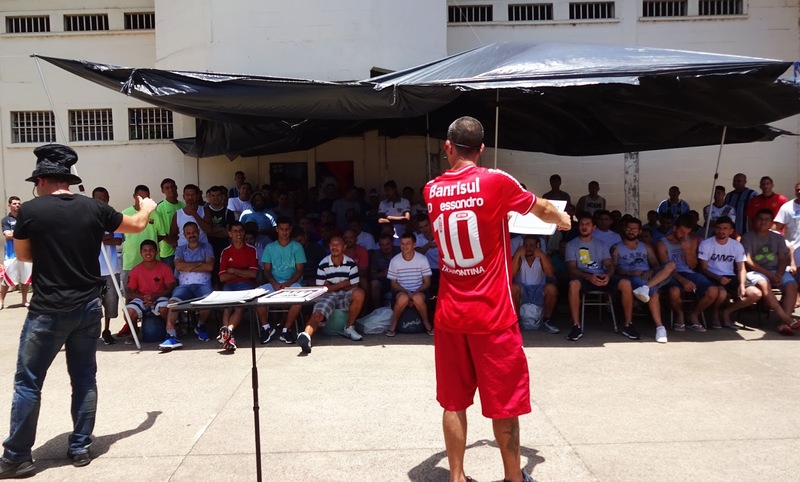 Then after we “win” them, we are able to share serious things with them about change, about forgetting the past, about using the time they have here in prison and about beginning to talk to the Living Father. By the time their names were being called to go back to their cells, they were like our family and did not want the day to be over. I make up little gift bags for them with little toys, candy, games and things to read. They were so grateful and gave us each a hug. The prison director printed a story about this day on there national web page and he and all the workers told us that these men never get visitors. It was such a privilege. 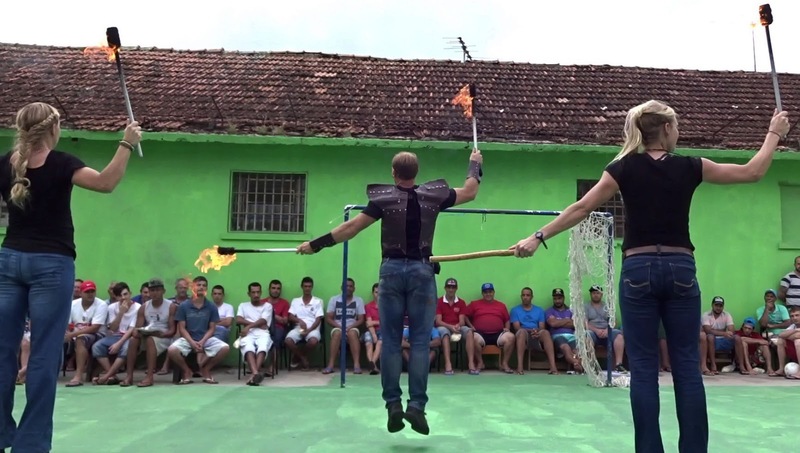 A magic routine to the Cirque song, “Algeria”. 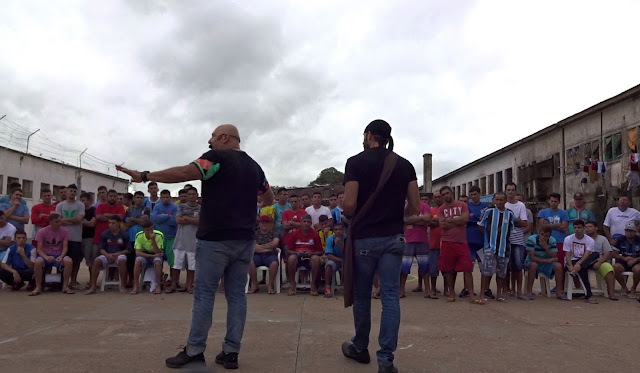 At another prison in a city way out in the country, we did three presentations, each for around 200, to 300 guys and were able to reach one entire section of the prison. The area was not ideal because there was not much space and the acoustics were a nightmare, but we figured it out:) The men here were very sad and had long sentences. It took work to get through to them, but by the time we left, we were family. My sister made a magic trick that looks like a miniature prison. She shows it empty inside with nothing except steal bars. Then she makes a flower appear inside. She teaches how even in this terrible place, life can grow. In the place of our hardest suffering, God can bring something good if we yield to Him. 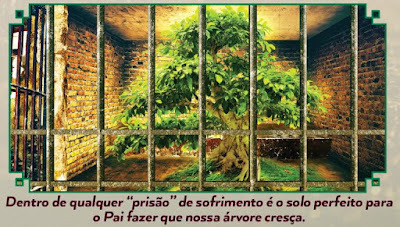 In the “soil” of suffering, a tree can grow. 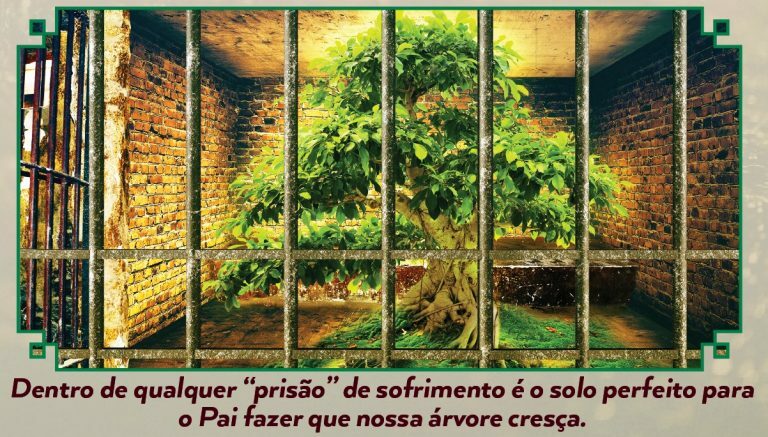 We have a poster that my brother made that shows a tree growing behind bars. Before I did my Irish style step dance, I shared how people can say so many things about us and we have so many lies in our mind about our future. Like when I had my accident and broke my leg, the doctors told me I would never walk the same again, but now I am dancing. Our future is not written in the stars. We decide who we are and who we are going to be. Even if they are going to be in these walls for a long time, they can still choose their attitude and the kind of man they want to be. No matter what happen in our past, we can have a beautiful future. Some of the men were moved to tears when I shared and they really listened. 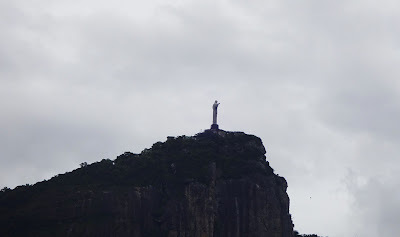 We took a trip to Rio during the week of Mardi Gras. Literally millions of people flood the streets every day. We performed on the streets and beach board walk and also made beautiful flags with Portuguese messages on them that we carried in the large crowds. The beaches were just crammed packed and we walked them with our flags talking to the people. Countless people would come up and want to talk and take the flyers we were giving out (we gave out 30,000 beautiful color flyers all together that said, “don’t give up, you are wanted” on the front). We also had many Bibles to give out and talked to people who had never read the New Testament. I couldn’t believe the hunger and how grateful people were that we were there. Many told me that we made their carnaval. One young man told me he stopped believing in God because of all the hypocrisy in the churches. He really listened to everything I said and said he would start again to seek God on His own and read the Scriptures. His name was Stefano. Another young girl had seen us in another city and did not get the chance to talk. She was so excited to see us again and eager to listen. Her name was Francias. 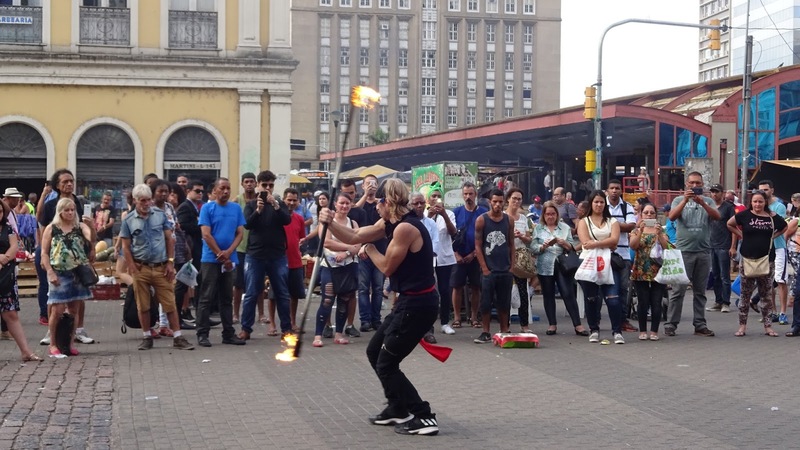 We talked to people who had seen us in Argentina, Chile and the US. We talked to people from Egypt, Italy, England and many other countries. A young women told me that even though she is acting happy, her heart is so sad and she is suffering inside. Her mom had died of cancer recently and she felt so alone. Her name was Tamaries. She said for the first time in a long time she found hope. Many groups of young men were eager to listen and hungry to find something that could give them purpose. Like all of us, they want to matter. 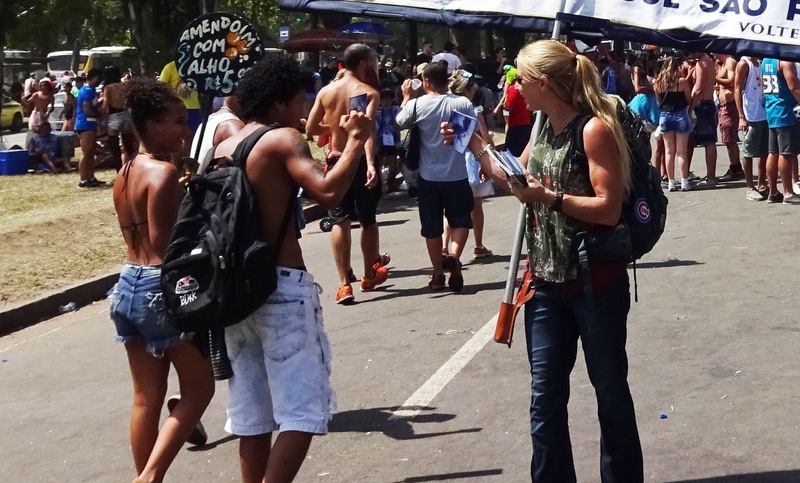 Talking to people in the large crowds of Rio. The main beach, Copacabana, which is usually full of upper-class people, was now packed with 1.5 million poor people. Most of them were 18-30 range. I could not believe the attitude of these young people. They were so different. Humble, broken, eager to listen, making an effort to come up. One kid was just like “I know, I know, you’re right, what are you telling me about Jesus? What is this?” The look in his eyes was that he was about to cry. 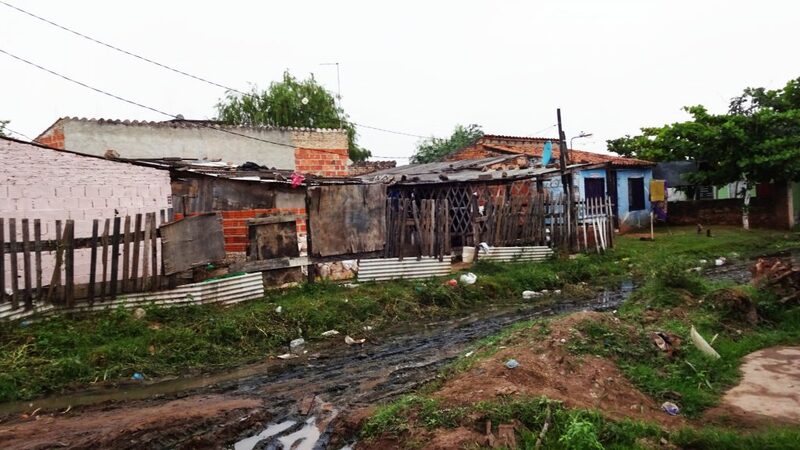 Here these kinds of kids live in “Favelas” which are massive slums that go up a mountain, full of garbage, sewage, and crime. The majority were not “punky” but deeply wanted to hear and know what we were saying. Two kids in camo shorts came up asking for a bunch of our flyers, I was skeptical, but gave them each a pinch. Then they walked up and down the beach and just passed them out saying “you need to read this, this is profound”. They were sincere. They gave them to all their friends and just wanted to be apart of it. There are certain churches here that are very corrupt and scam people into giving them money in the name of God. Plus the government is very corrupt and does nothing to really care about or help the citizens. So many are just at the point of giving up. To be able to bring them the hope of the Gospel and tell them that God really cares about them and remembers them was such a privilege. Many news papers reported on us and people were just shocked by the love and courage they saw in seeing American come to their dangerous city to help them. Talking to individuals during carnival. We stood outside the Sambadrome and talked to just floods of people going in late at night. 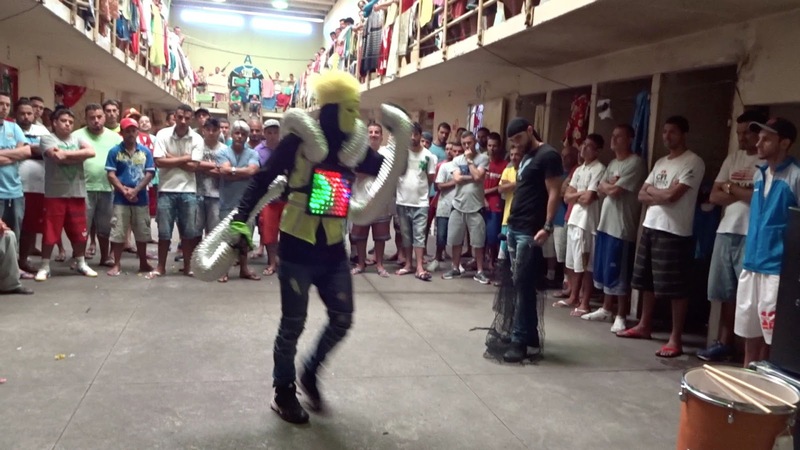 I had always thought the whole Carnaval, Sambadrome thing was really something and would be like the ultimate party for all these people. But it was so nothing. Since the government is corrupt and takes all the funds, there was literally nothing for all the poor and the crowds to do. No beads, no games, no floats no decorations to see. 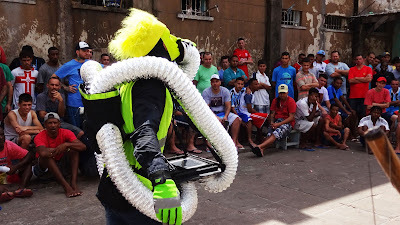 The rich can go inside the Sambadrome (which is a huge 90,000 stadium) and see the floats, but the poor can only observe from a distance, sitting in bleachers separated by a river of sewage, no exaggeration. It was really sad. 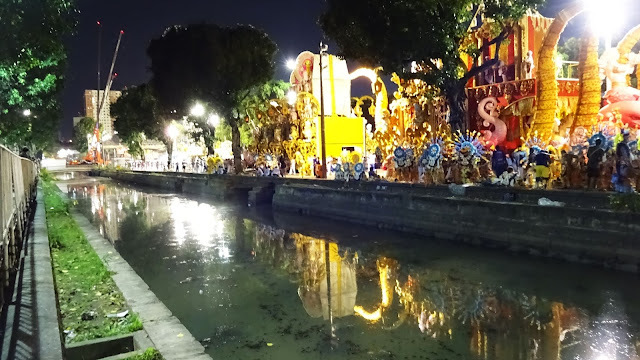 You can kind of see from this picture how the floats and parade was on one side of the river, and then on the other side there were bleachers where all the poor sat to try to catch a glimpse of the parades before they went into the Sambadrome, separated by a river of stench and waste. 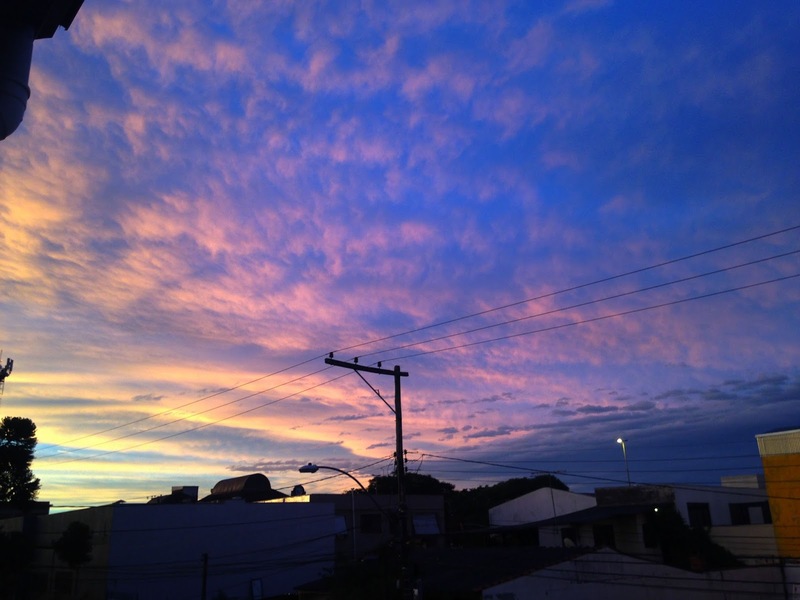 It was really a stunning picture of the reality that is Brazil. We had a beautiful time inside a women’s prison the other day. It was pouring rain so we had to cram into a small space but we were able to really touch some precious women who were hurting. I am so grateful to the chess company that donated some beautiful quality chess boards to us that we can give to those we meet. It has been such a blessing and those that receive them are extremely grateful. It allows people in difficult situations to get lost in the game and focus their minds on something besides their pain. We can learn so much from the game of chess. If we just take what life gives us and meet it move for move, we can be defeated. But a strategy for victory requires that we go beyond ourselves and find the unexpected move. We have a flyer that we give out to prison guards, police and military with a chess piece on the front. We use the idea of chess to explain how, often we are put in positions that require us to make difficult decisions. But if we do not repay “evil for evil”, but evil for good, we move ourselves into a place of victory and can break a cycle of hate. I know at times we feel like, just below the ‘happy’ surface, is an undefined grief. Our pain can get the best of us and without realizing it influence our life. Remember that no matter what you may be going through, God is a deeply compassionate Father Who, not only knows our weakness but, yearns to comfort us. There are real answers to the most difficult struggles in life. God looks to the broken and contrite (Is.57:15). Just consider, ‘Maybe I don’t know everything about You, God. Maybe I could learn”. It involves not going to others but directly interacting with the One Who sees our deepest hurts and pains and can heal us. We actually have a God that we can talk to, and He hears us. You do matter. If you could just start to forget about yourself, and decide to matter to someone else who is hurting, you would realize just how much you can matter. The world is full of suffering and shattered souls. They need what you and I can give them, love. A thousand sad faces sit behind a thousand “closed windows”, wishing and hoping that some day, some how, someone might open there window and whisper to them, “Hey friend, don’t give up, you do matter”. Let us be that whisper. 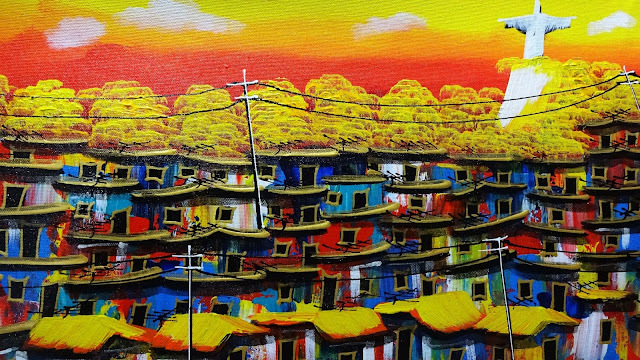 Painting I saw in Rio. Love is the answer. The question doesn’t matter. A little boy at the orphanage we visited. After a long, turbulent flight and delayed layover, my family and I made it to Brazil safe and sound:)! It’s really good to be back and to have so much opportunity before us and so many open doors, we pray for Gods grace to carry us. We have had to do a lot of work these last weeks to get stuff ready. The vehicle that we had here was not in the best shape and we had to work on it to get it fixed up and running again. The day after we landed there was a super cell storm and it poured all night. We woke up to a river outside our door:). Since we had not yet exchanged money or got groceries and water, we had to wade through the river to get to the store:) We were knee deep trekking along for a few miles (trying not to think about everything we were stepping on and everything that was floating in the water). The whole city was completely flooded and our street was actually better than most! Hey, its Brazil and this is just another adventure. 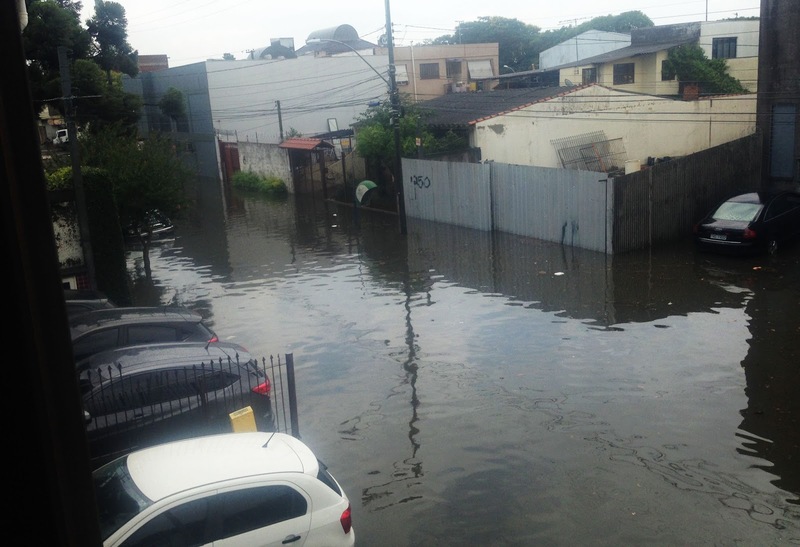 Its funny because in this part of Brazil there are no tourists that come, so everyone is surprised to see Americans (especially Americans wading through flooded streets) and tend to stare and want to try out their few English words. Since we are so far in the middle of nowhere, and they all dream of making it to America, they are so surprised to think someone from America came here (especially into the prisons). 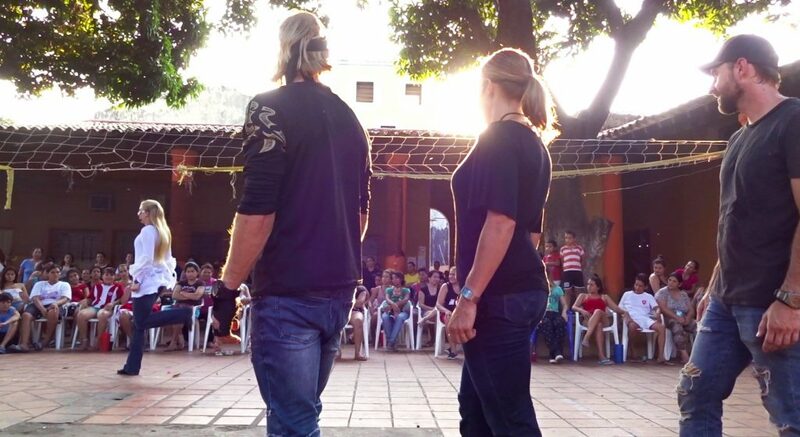 Performing in an orphanage in Southern Brazil. 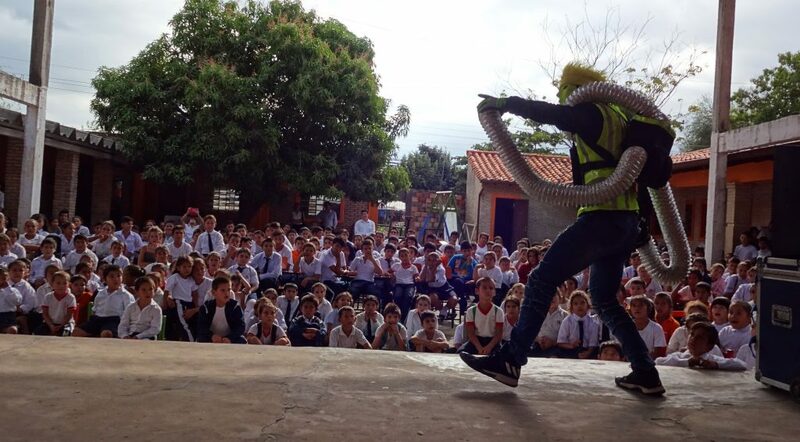 Getting kids to participate in our performance. The children were so precious and so grateful for every little thing. We had games, activities and prizes. Total chaos and total fun! 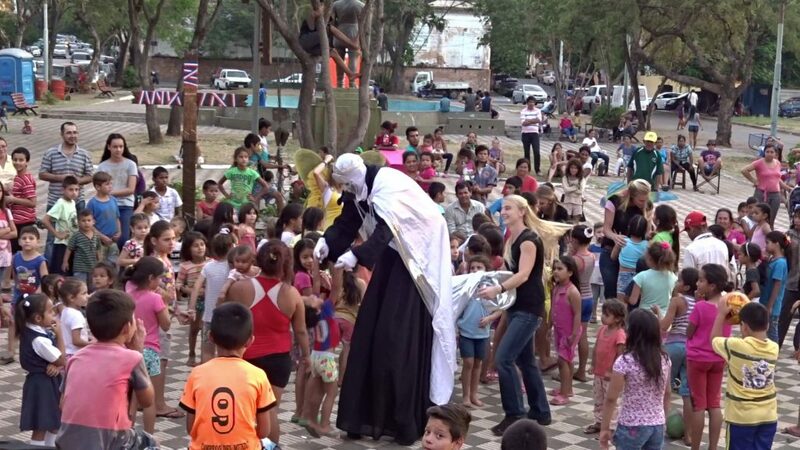 We certainly got our work out picking up kids and throwing them in the air:). The director was explaining to me that usually the little children will get adopted, but once the kids are around 10 and up, no one will adopt them and they will live at the orphanage till they turn 18. You see so much sadness in the older kids eyes. They know that no one will want them and they will never find a home. Then once they turn 18, they have to face a very difficult world all alone. I think its the most beautiful thing when you hear stories of older kids being adopted. The director also told me that anyone who adopts a child has 6 months to “return” them. So if they change their mind they can bring the kids back! Think about how that would break a little child’s heart! Twice they were unwanted. There were two kids there that had been given back. I just wanted to hold them all day. My brother running a game at the orphanage. Through the different acts in our show, we communicate to them that they have a Father who loves them and wants them. 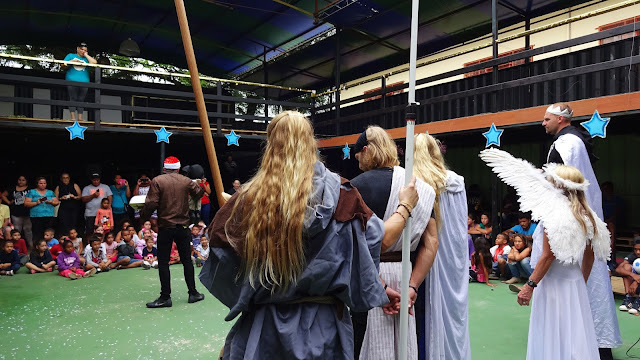 For Christmas we did a special play about an orphan who is sad on Christmas because he has no one and nothing. The orphan (A cool looking puppet) then is read the story (by my brother using a beautiful light up book) of the birth of Christ, which we act out.A Father gave the world His Son, Jesus, the Son showed the world the way back to His Father. No matter what we each may go through and deal with in this life, and no matter how lost we may feel at times, God is not a pastor or preacher. He is a Father who loves us. I was so surprised that even the small children were throughly engaged in the story and were quick to answer questions. After our performance my brother was Santa Claus and all the kids took turns sitting on his lap getting their gifts. I think this was the first “gringo” Santa they have seen, but they didn’t mind:) My brother was so overwhelmed with kids, and the costume was a little too big. It was hard not to laugh while trying to keep the kids organized. 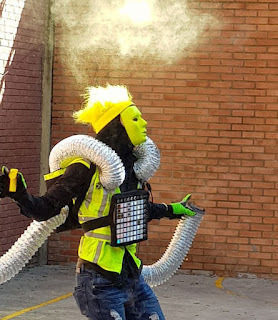 Performing at an event in a poor area. Giving out Christmas gifts with our special giant frog and elves. The down town plaza has been very, very busy these days leading up to Christmas and we performed in the center for large crowds. I love just being on the streets in down town city areas. It is difficult because you’re just out there and any thing can happen, but you reach people from all walks of life. We had so many people that came up to us and told us that they had seen us from other events. It made us realize that we are reaching this whole city. A few men actually saw us perform inside a prison when they were a prisoner, and now they are free! This one guy came up to me the other day and leaned in to whisper in my ear that he had just got out of prison. He remembered me performing my Irish dance inside his prison and telling him about how to focus his mind and leave the past in the past. He wanted me to know that he was changing and that what I had shared really helped him. It meant a lot to me. Sometimes you just don’t know if anything you do matters, you just hope. Like sowing seeds, maybe one seed will change someones life. 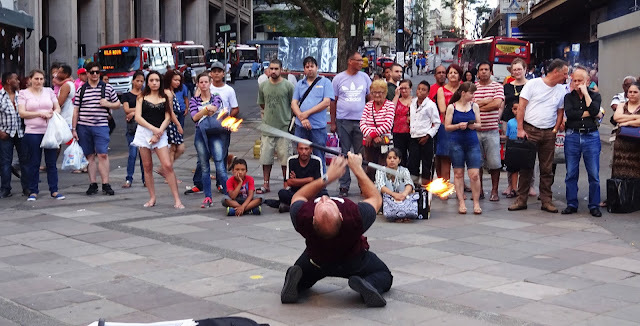 Its tough on the street because you have to deal with drunk people and crazy people wandering through your crowd, cops, traffic, thieves and lots of things you would never think of if you didn’t see it. Its a lot to handle, but being able to reach so many people makes it all worth it. One lady in the crowd told us that she thought we were there just for her. Her mom died of cancer and she was really going through it. She said at times she felt like she just couldn’t make it and wanted to give up. She said after listening to all we shared she finally found hope. My brother performing a rap he wrote to a group of prisoners. We performed inside the largest prison here as well this last week. It was actually on lock down because of a fight that occurred, but a certain social worker sort of snuck us into an outer patio so we could visit with the guys she cares for. It was really sad to realize that the prison was closed to visitors for Christmas so none of the prisoners got to see their families on Christmas. They said that this Christmas, we were their family. It was a smaller group this time so we could really spend time with each of them, listening and teaching. 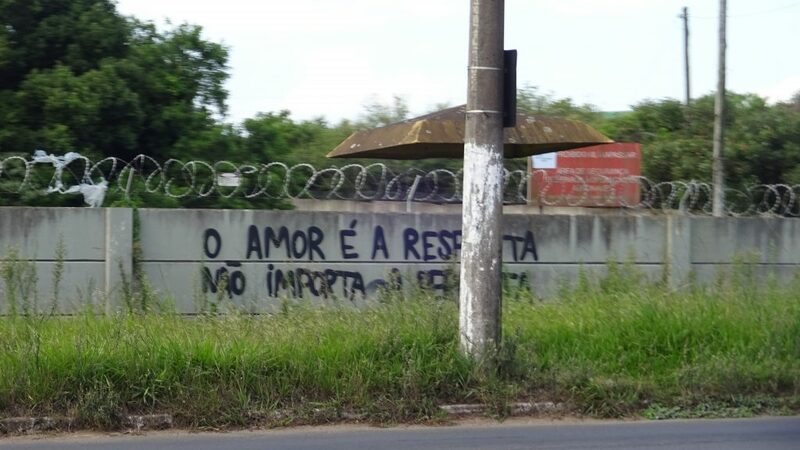 “Amor é a resposta. Não importa qual seja a pergunta. – Love is the answer. The question doesn’t matter.“ I saw this quote graffitied on a wall in a bad neighborhood here and really like it. Sincere love can heal even the deepest wound and bind together a broken life. Maybe someone you know is going through a hard time and you don’t really know how to help. Love will never let you down. Love them with selfless love, and you will give them exactly what they need. That’s what God did for us on this day we call “Christmas”. He gave mankind everything they would ever need, for all time, when He gave us His Son. It was just an ordinary night in an ordinary town and yet something extraordinary happen. Hope was born and they laid Him in a manger. God is love. He came to earth and was born in a stable. For the very first time, a Light dawned in a dark world. Love was born and they named Him Jesus. From that day forward, no matter what question, issue or problem we may have, God gave us the answer when He gave us His Son. Merry Christmas everyone, and this New Year, may you find the blessing of the Fathers love like never before. His loves written in the skies.